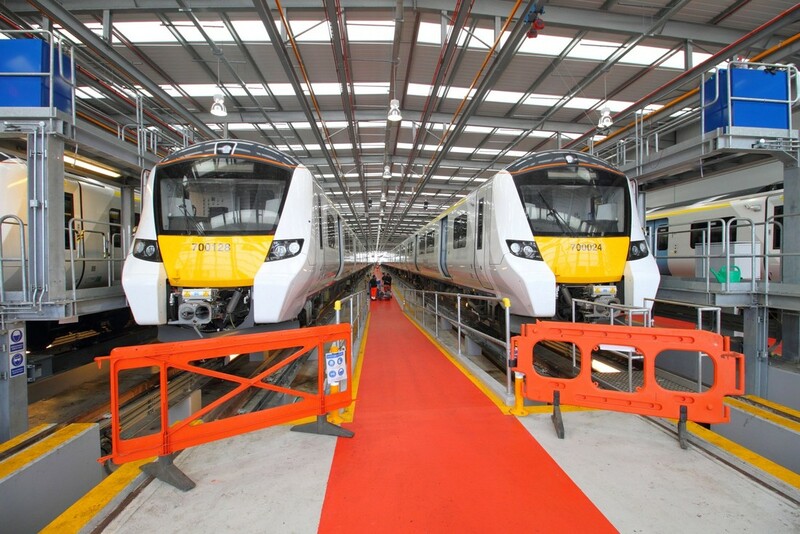 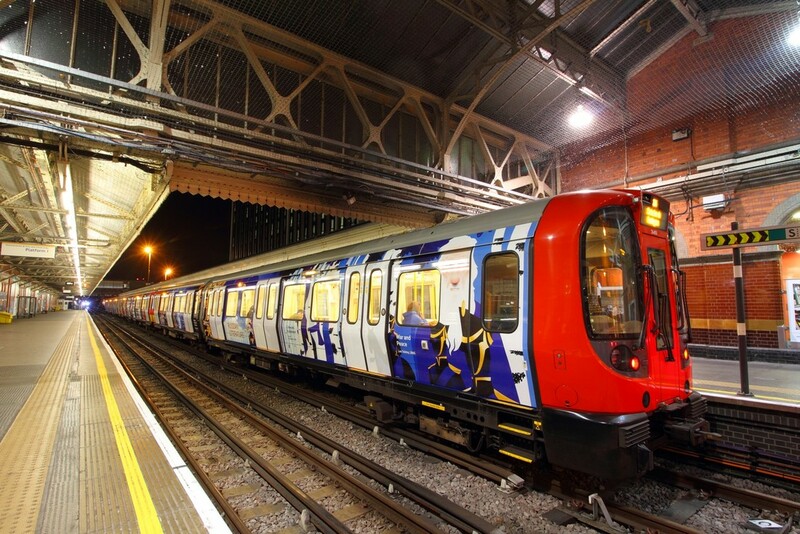 On 25th October 2017, London Underground unveiled a Russian-themed train showcasing the country's cultural achievements. The 'Heart of Russia' is a partnership between the Moscow Metro and the Tube with each carriage focusing on a different subject within Russia's culture and history. 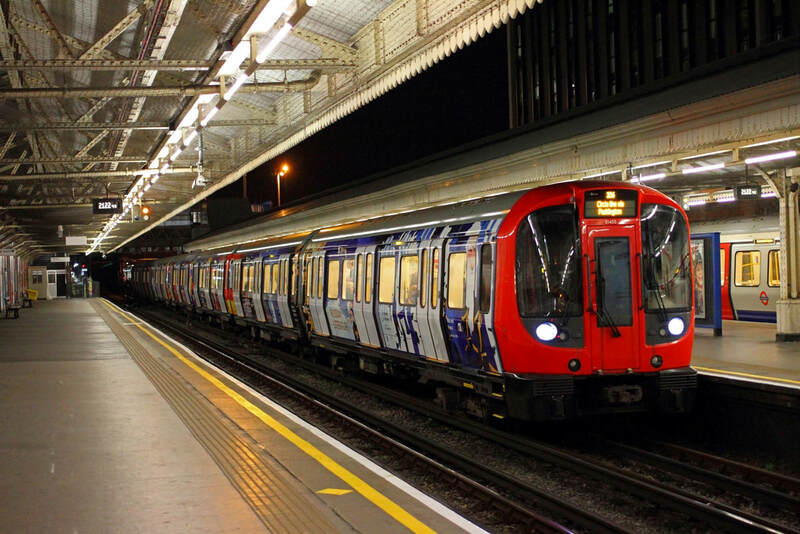 London Underground No. 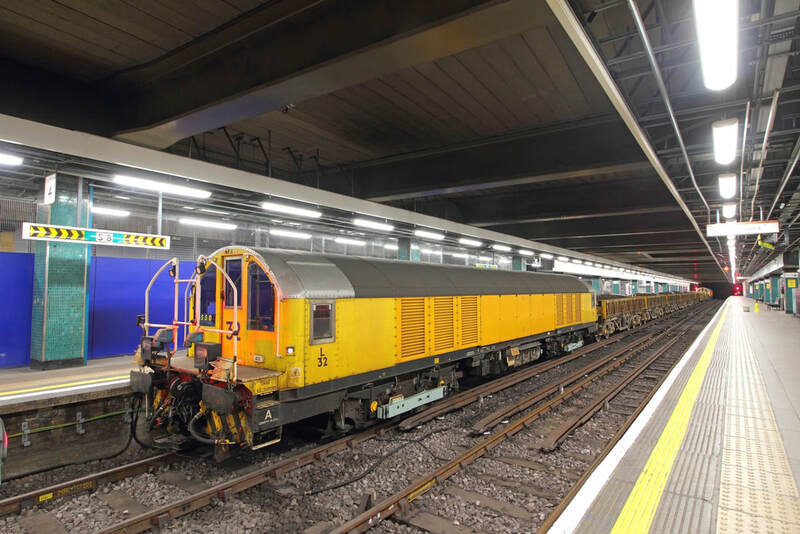 21455 carries the Russian culture vinyls and is photographed working Train 206 2044 Aldgate to Hammersmith circle line service at Hammersmith. 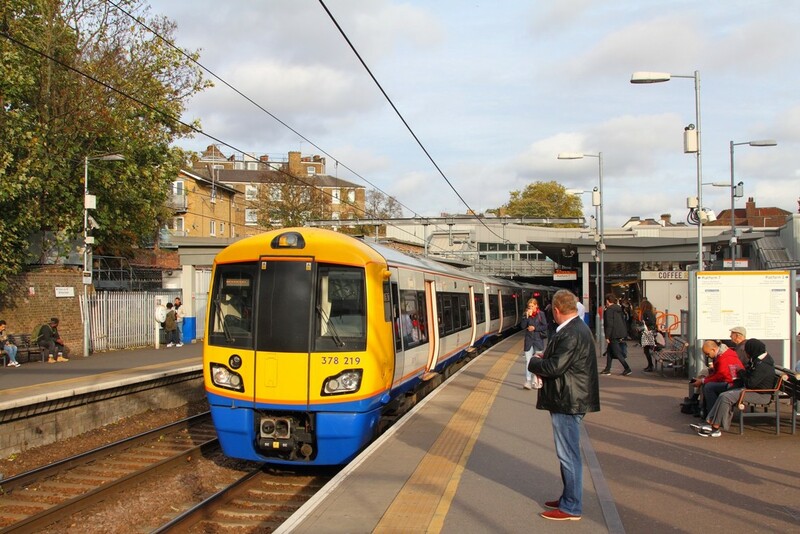 London Overground ​378219 at Highbury & Islington with the 2N77 1515 Stratford to Richmond on the 24th October 2017. 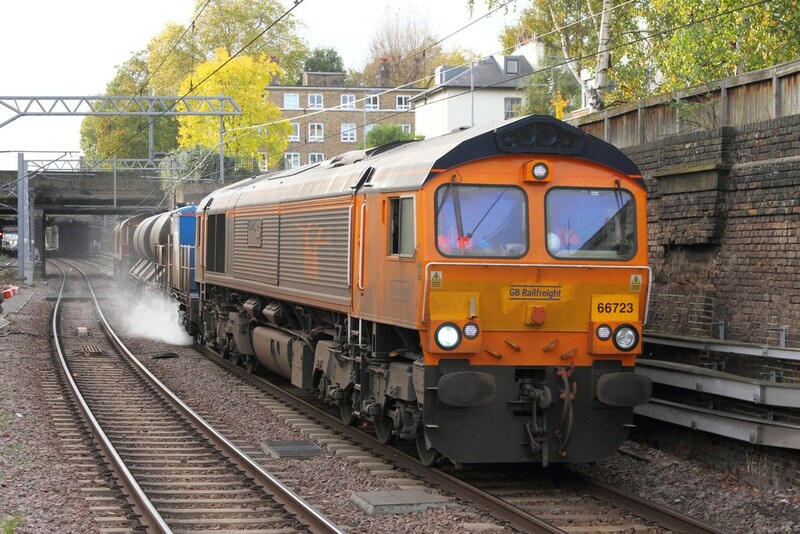 GBRf 66723 tnt 66710 on the 3S81 Broxbourne to Broxbourne via Willesden at Highbury & Islington on the 24th October 2017. 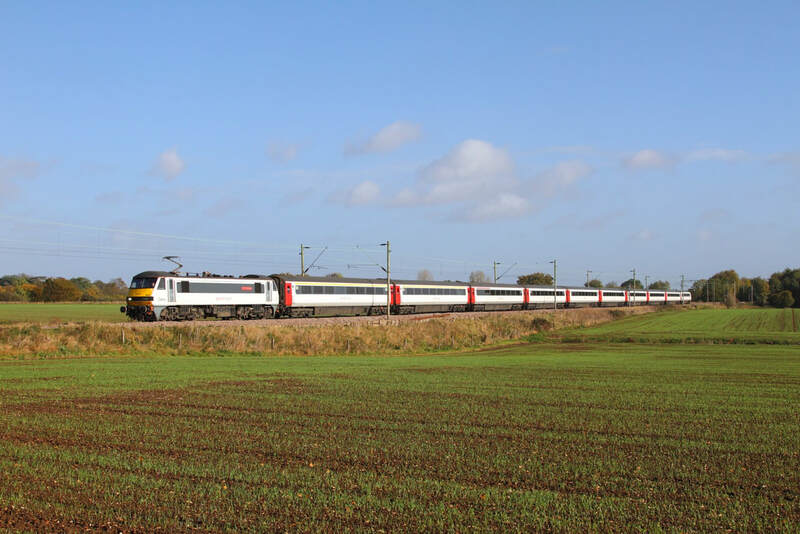 Cross Country 43207 on hire to Virgin East Coast leads 43318 on the 1S22 London Kings Cross to Skipton away from London Kings Cross. 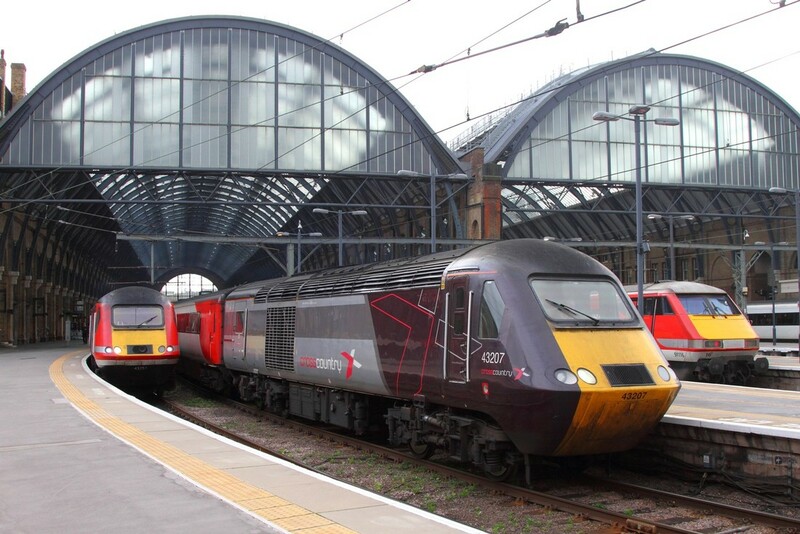 43251 and 43314 await to leave with the 1N87 1508 Kings Cross to York and 91116 will work the 1S23 1530 Kings Cross to Glasgow Central having worked the 1E10 from Edinburgh on the 24th October 2017. 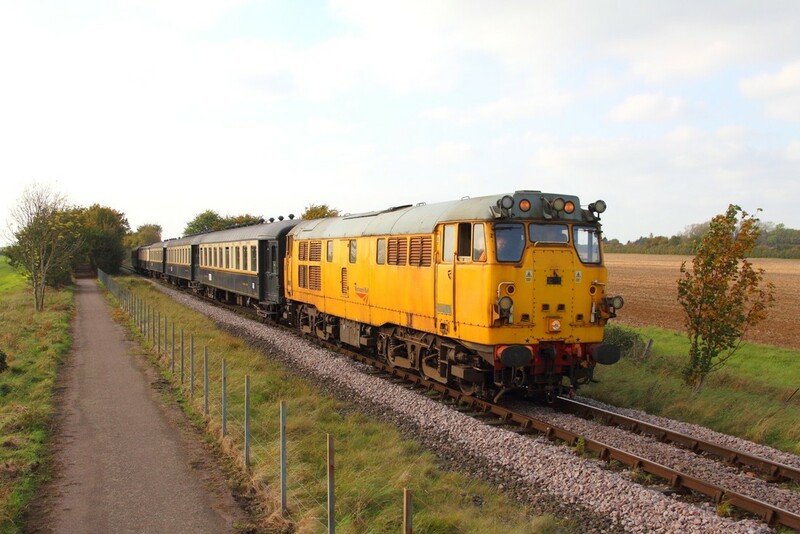 90008 on 1P39 1300 Norwich to Ingatestone at Cattawade on the 21st October 2017. 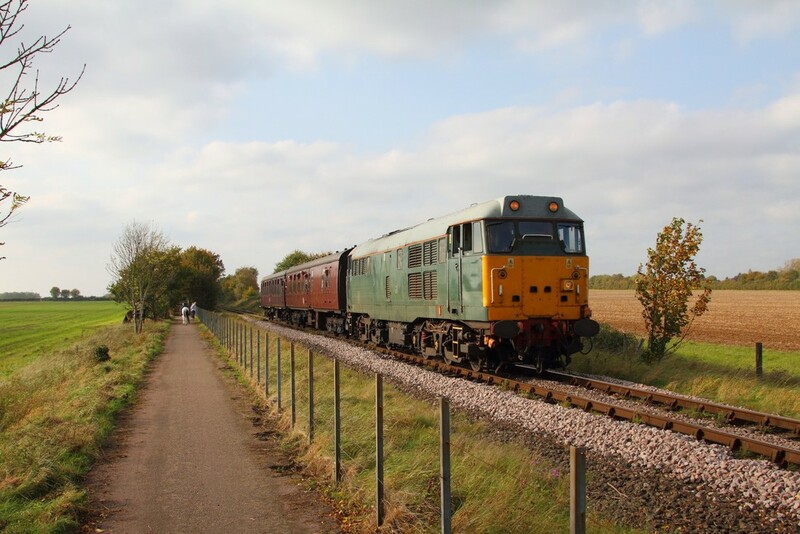 90015 tails 1P28 1251 Ingatestone to Norwich at Cattawade marshes on the 21st October 2017. 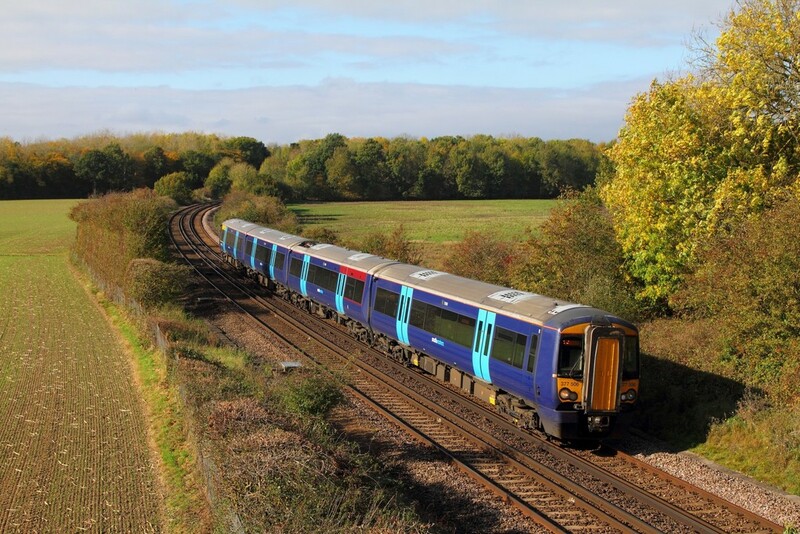 90014 on the 1P35 1200 Norwich to Ingatestone at Cattawade marshes on the 21st October 2017. 90009 on the 1P33 1130 Norwich to Colchester at Cattawade marshes on the 21st October 2017. 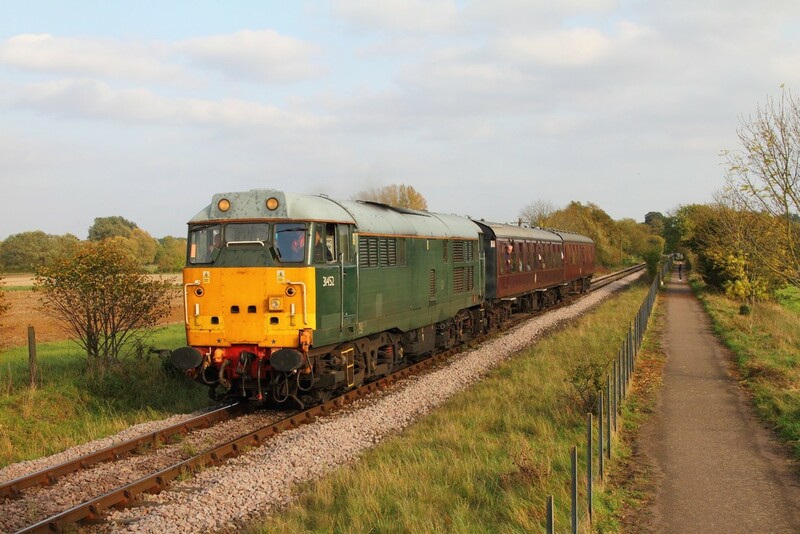 90008 on the 1P23 0900 Norwich to Ingatestone at Kelvedon on the 21st October 2017. 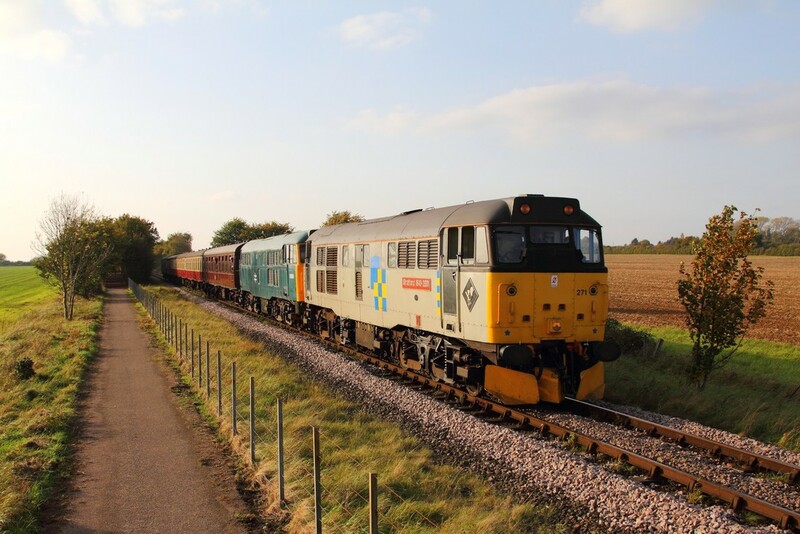 DRS ​57303 tnt 57306 on the 3S60 Stowmarket to Stowmarket via Chelmsford and Clacton on Sea at Kelvedon on the 21st October 2017. 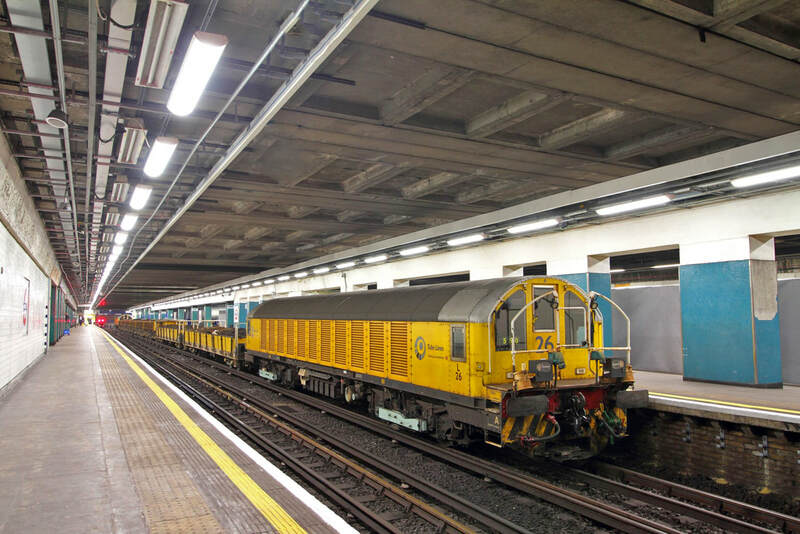 L26 and L32 top and tailed on a ballast train stabled in platform 4 at Moorgate on the 19th October 2017. 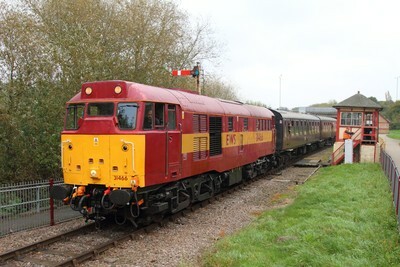 Apparently the battery locos have failed with broken contactors. 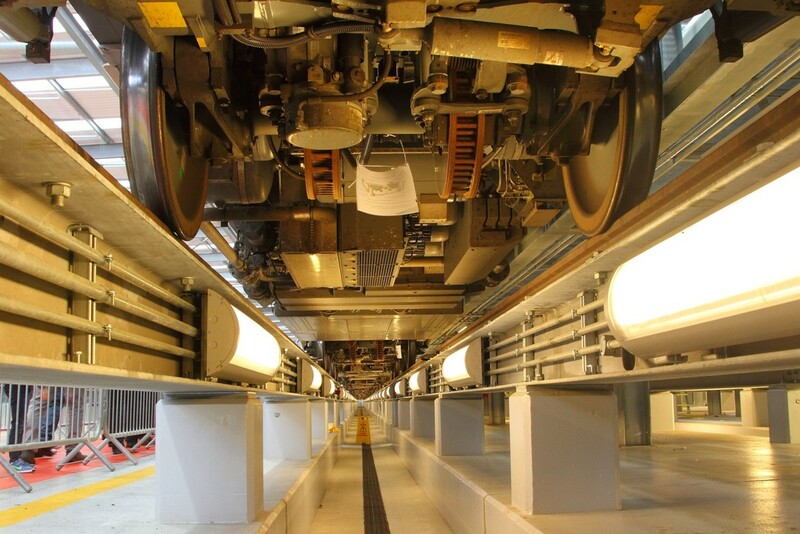 The rumour is that the contactors are not operating fast enough causing them to flash over. 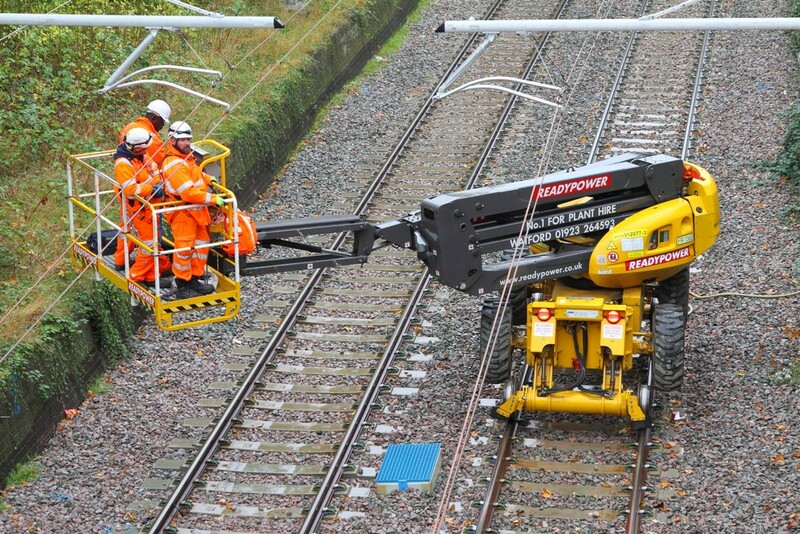 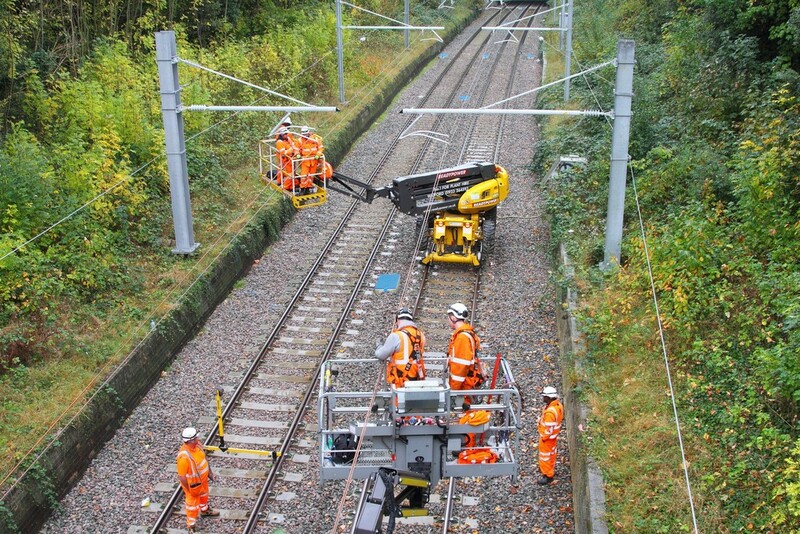 Gospel Oak to Barking Railway Electrification works at Crouch Hill station on the 18th October 2017. 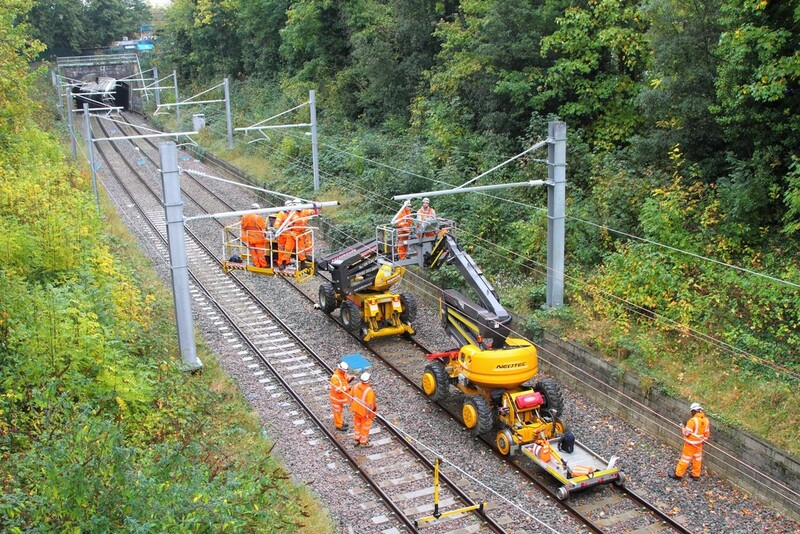 Electrification works at Crouch Hill station on the 18th October 2017. Colas Rail 56113+56096 on the 3S71 Shrewsbury Coleham to Shrewsbury Coleham via Holyhead at Colwyn Bay on the 16th October 2017. 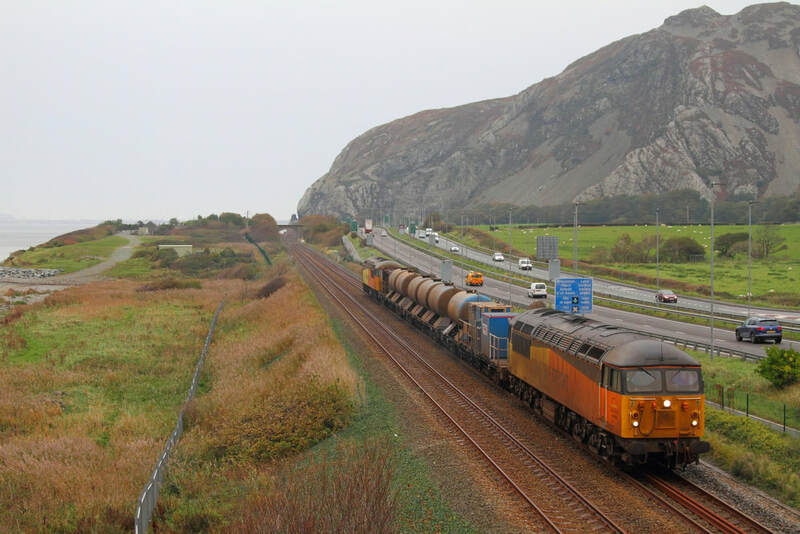 Colas Grids Nos. 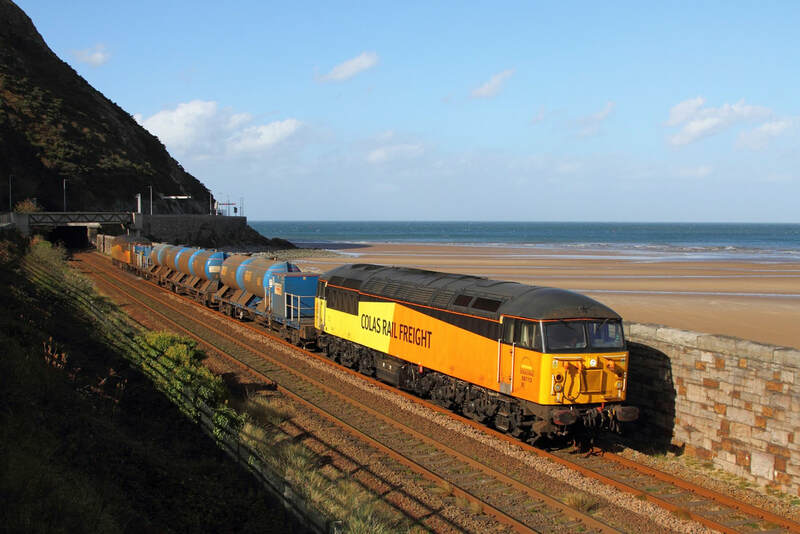 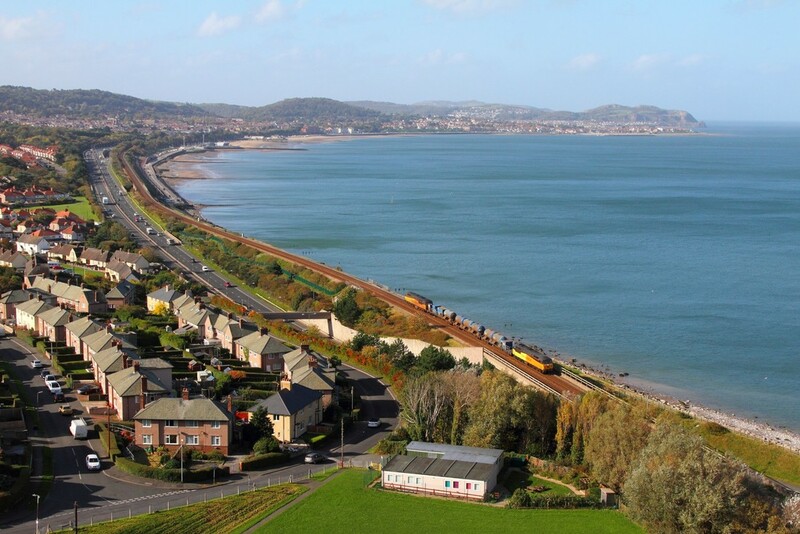 56113 and 56096 power the 3S71 Shrewsbury Coleham to Shrewsbury Coleham via Holyhead RHTT consisting of sandite (and can be seen spraying towards the rear) at Penmaenbach on the North Wales coastline on the 16th October 2017. 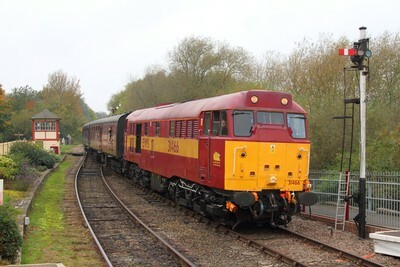 EWS ​67016 on the 1D34 0950 Manchester Piccadilly to Holyhead at Llanfairfechan on the 16th October 2017. 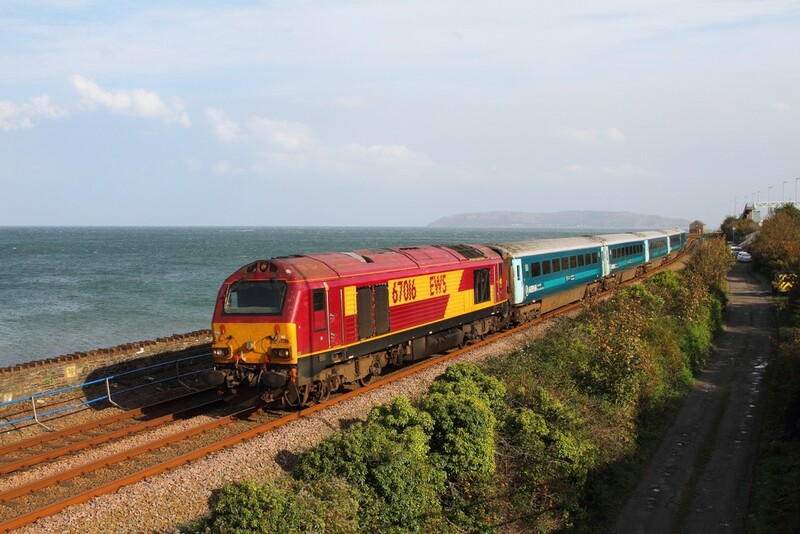 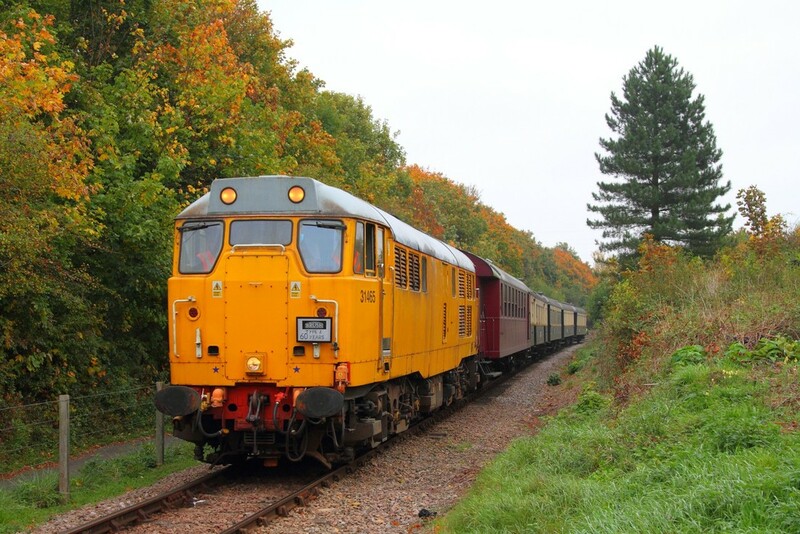 Colas Rail ​56096+56113 on the 3S71 Shrewsbury Coleham to Shrewsbury Coleham via Holyhead at Penmaenmawr on the 16th October 2017. 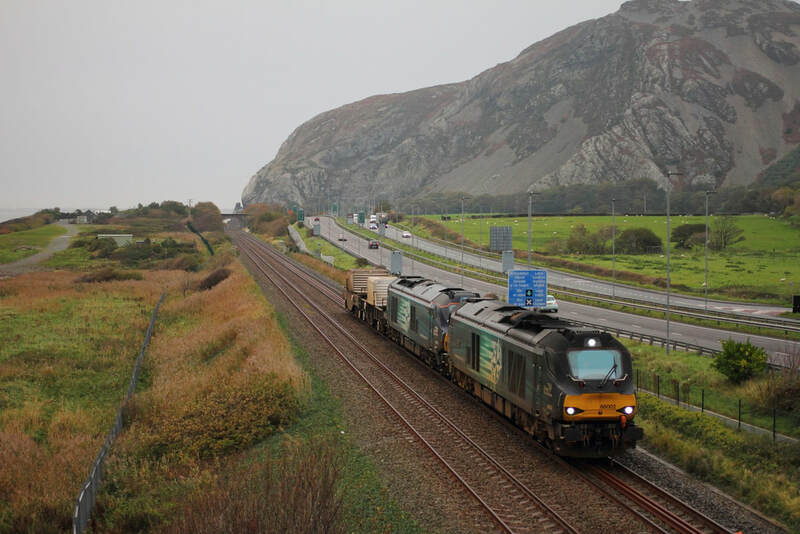 DRS ​68002+68033 on the 6D43 0731 Crewe to Valley at Penmaenmawr on the 16th October 2017. 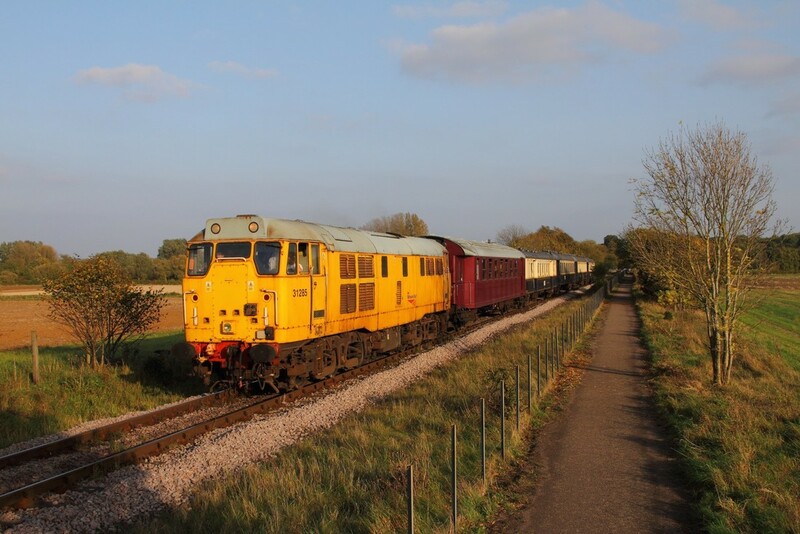 Network Rail ​31285 works the 2M53 1610 Peterborough to Wansford at Castor on the 15th October 2017. 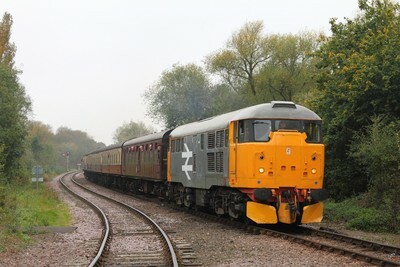 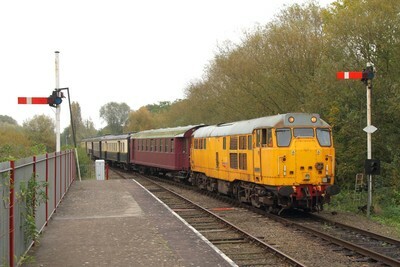 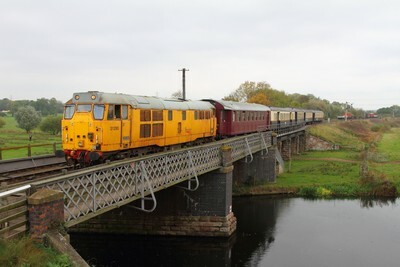 Network Rail yellow 31465 leads Br Blue 31459 on the 2M50 1410 Peterborough to Wansford at Castor on the 15th October 2017. 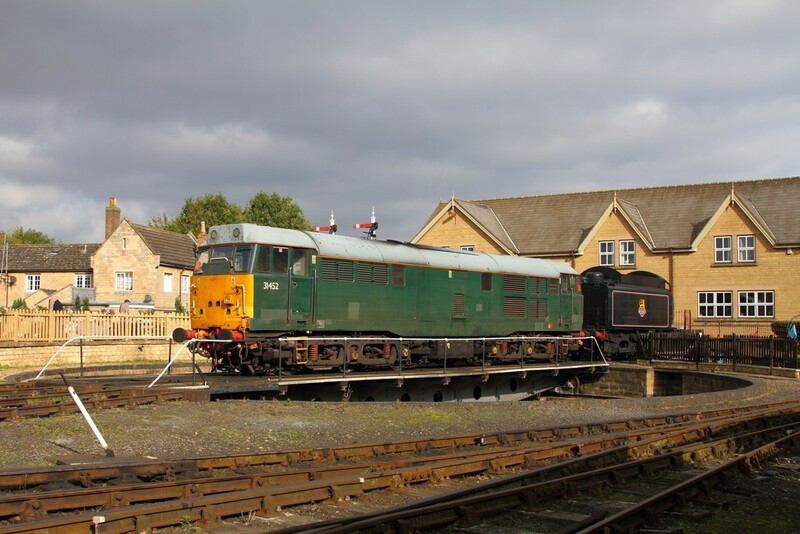 Br Blue ​31459+31465 on the 1E50 1322 Wansford to Peterborough departing Wansford on the 15th October 2017. 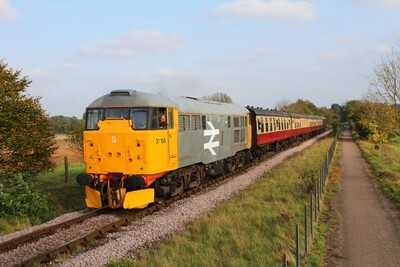 Br Blue ​31162+31271 on the 2M48 1250 Peterborough to Wansford arriving at Wansford on the 15th October 2017. 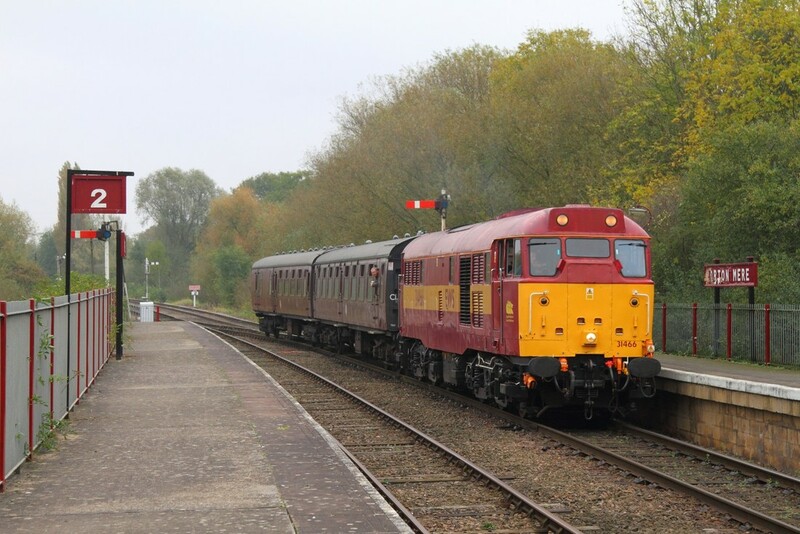 ​31271+31162 on the 1E54 1602 Wansford to Peterborough at Castor on the 15th October 2017. 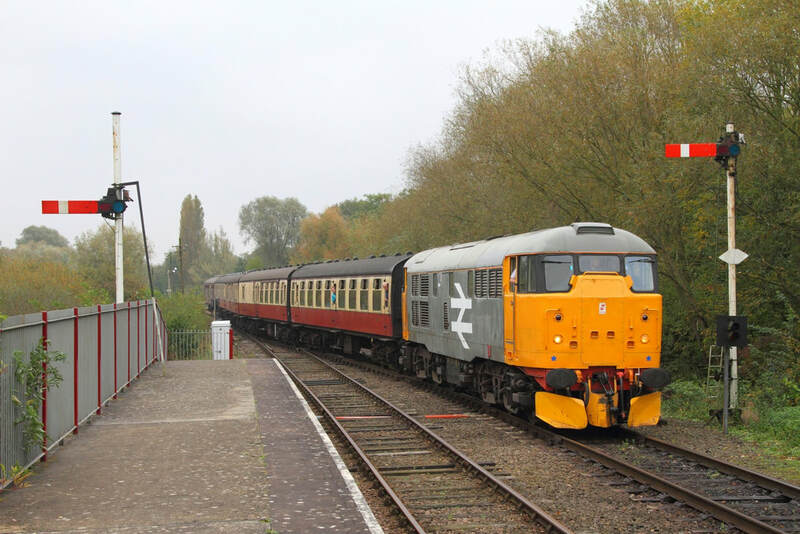 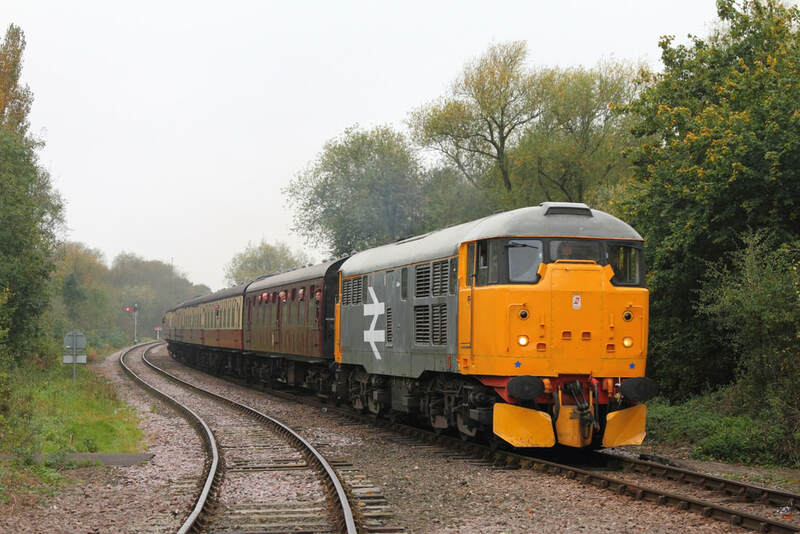 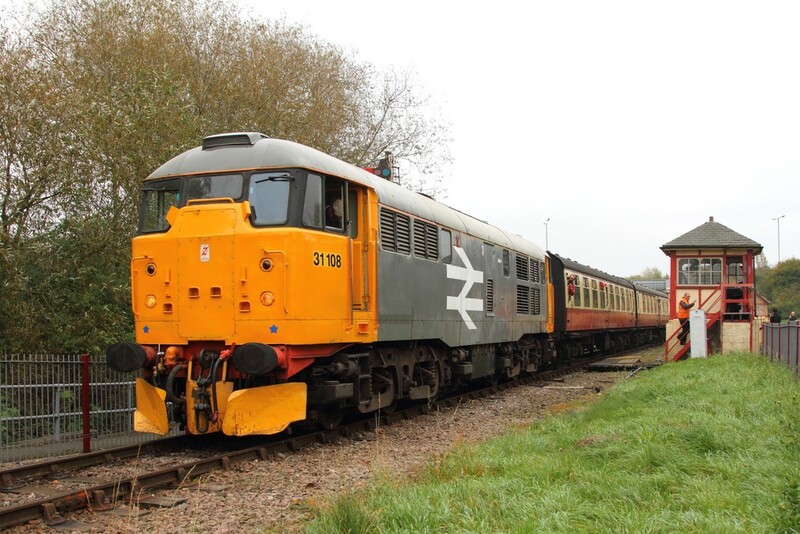 Network Rail ​31285 on the 2E53 1522 Wansford to Peterborough at Castor on the 15th October 2017. 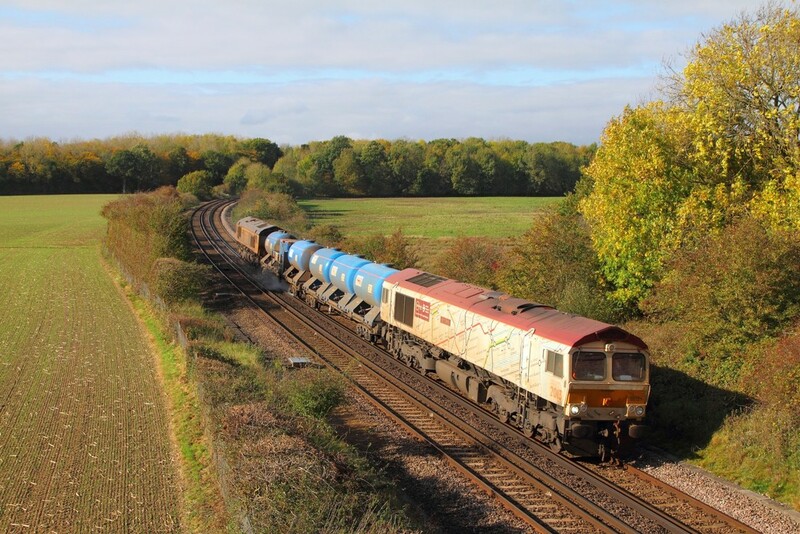 GBRf ​66721 tnt 66704 on the 3W01 0904 Tonbridge West yard circular (via Ashford, Hastings, Maidstone East and Swanley) at Westwell near Ashford on the 14th October 2017. Southeastern ​377506 on the 2N38 1322 London Victoria to Canterbury West at Westwell near Ashford on the 14th October 2017. 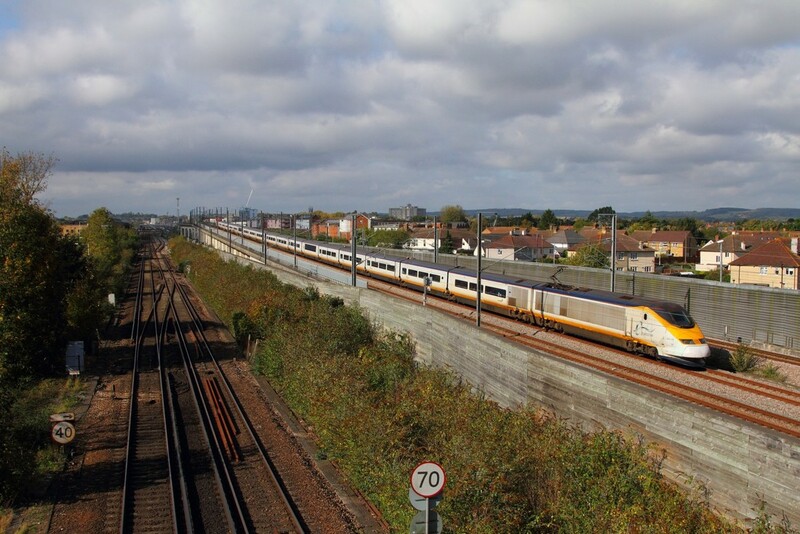 Eurostar ​3201+3202 on the 9I32 1258 St Pancras International to Bruxelles Midi comes off the Ashford flyover at Sevington on the 14th October 2017. Fastline 56301 leads 56081 on the 6X89 Dollands Moor to Clapham yard with South Western Railway 707029 and 707028 at Sevington (Ashford) on the 14th October 2017. Underneath 700128 at Three Bridges on the 14th October 2017. 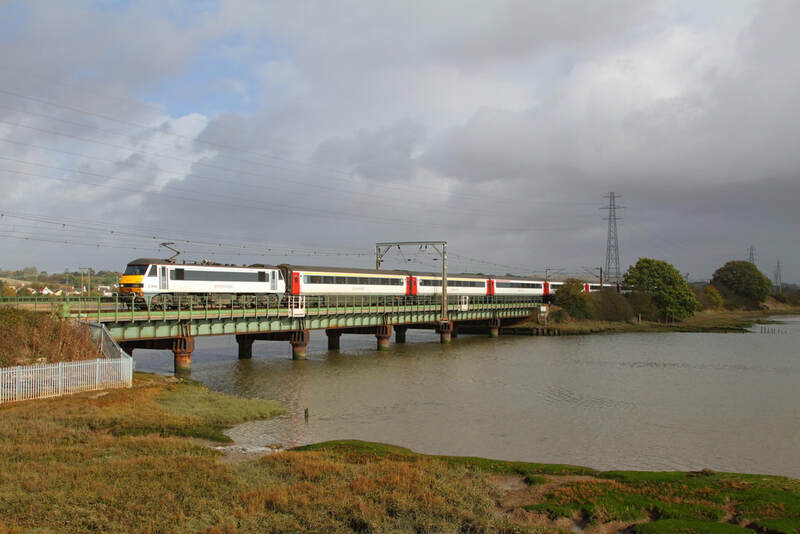 Thameslink 700128+700024 at Three Bridges on the 14th October 2017. 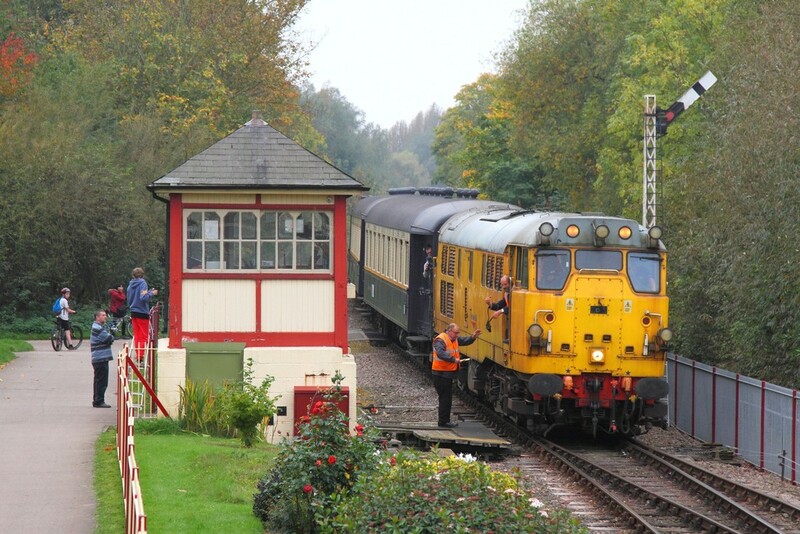 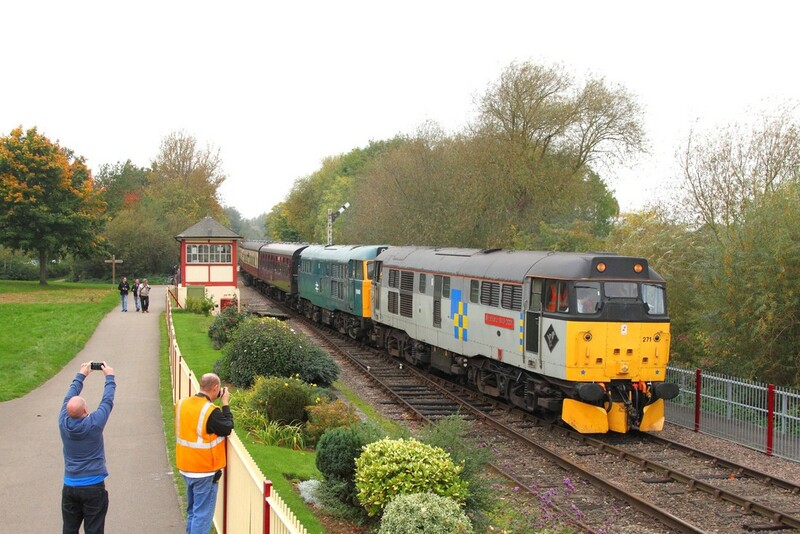 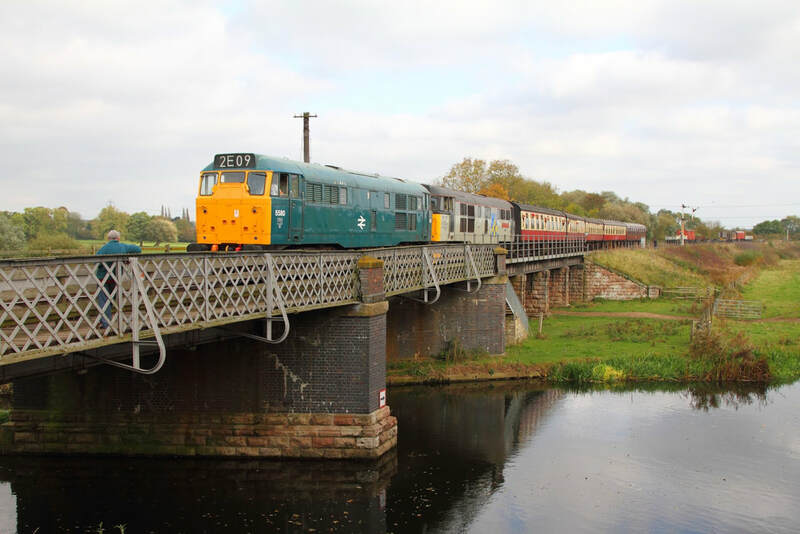 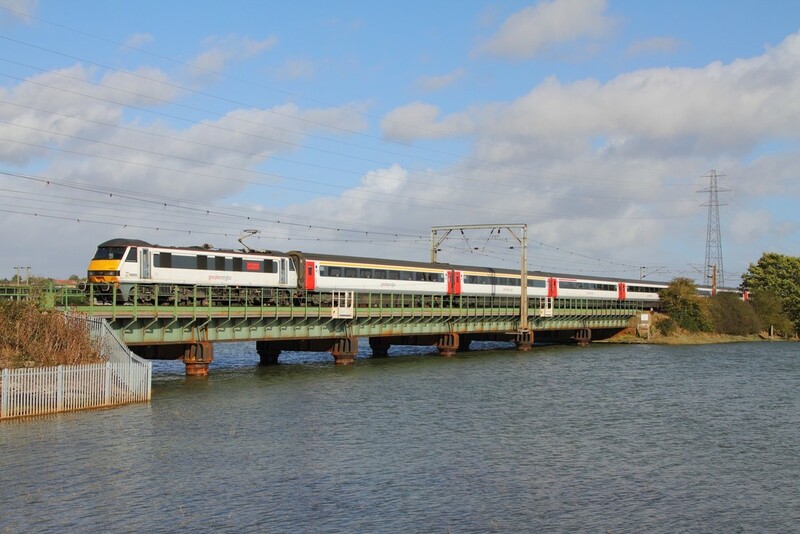 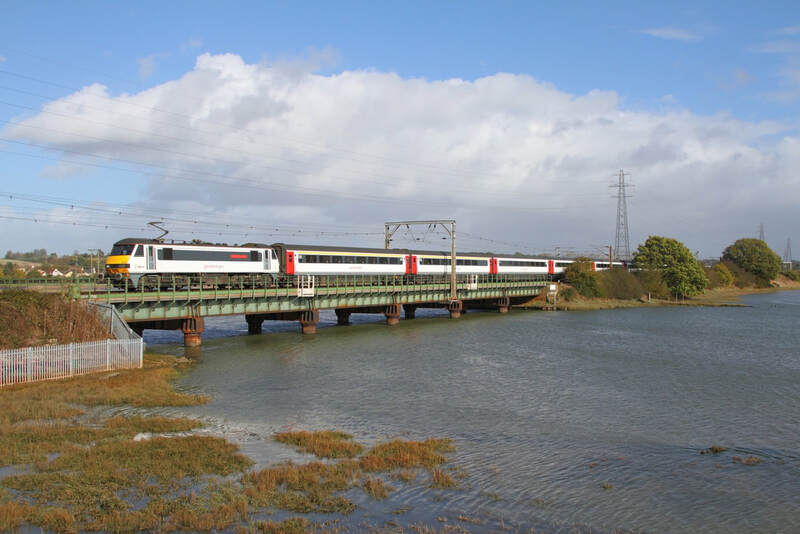 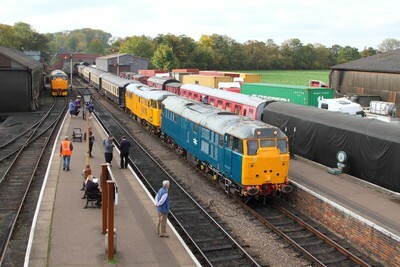 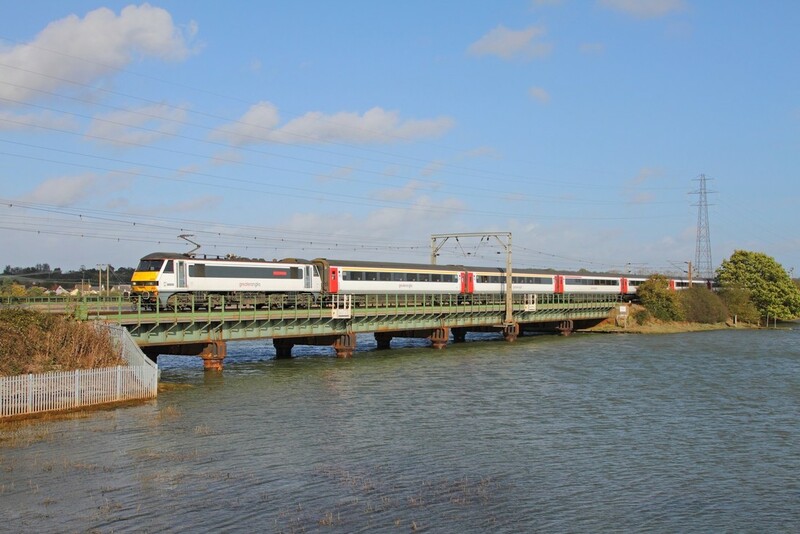 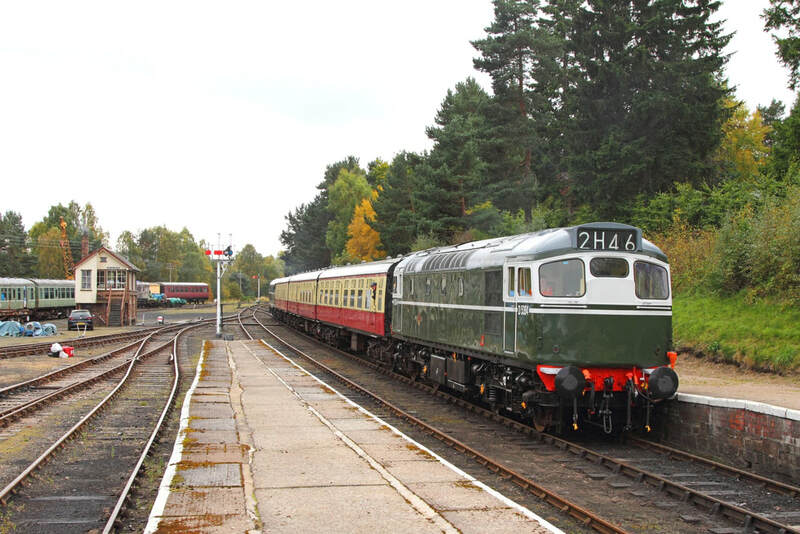 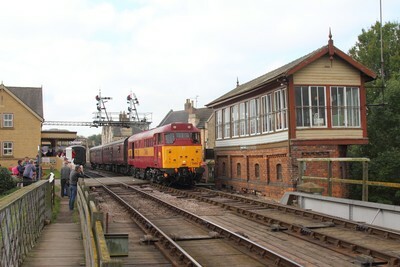 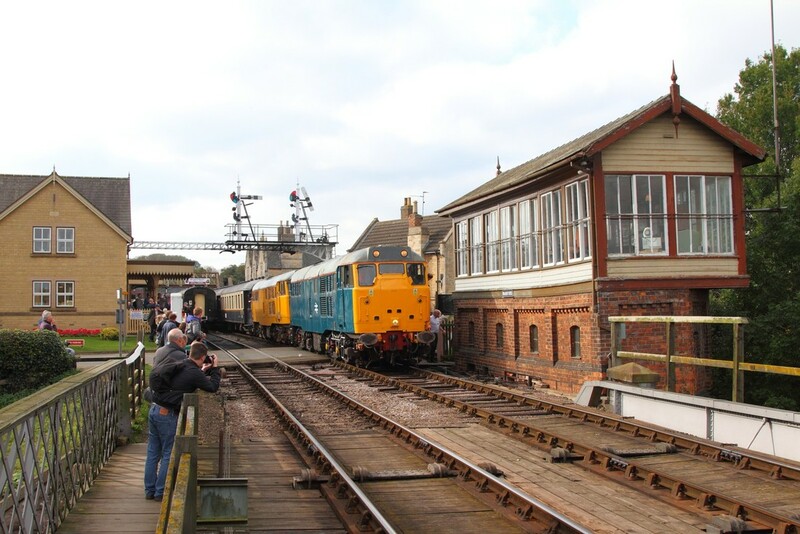 Three Bridges Open Day: 700009+700024+700128+700120+700123 at Three Bridges on the 14th October 2017. 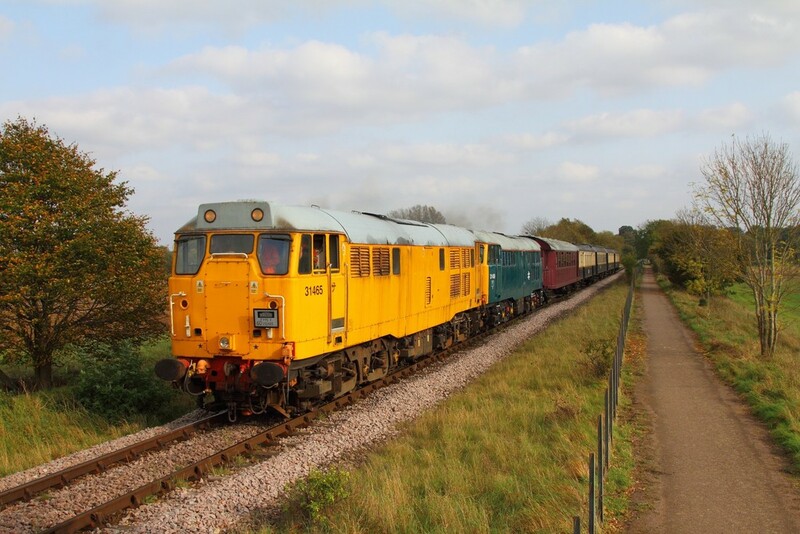 Colas Rail ​67027 tnt 67023 on the 1Q18 Old Oak Common to Derby RTC at London Paddington on the 14th October 2017. 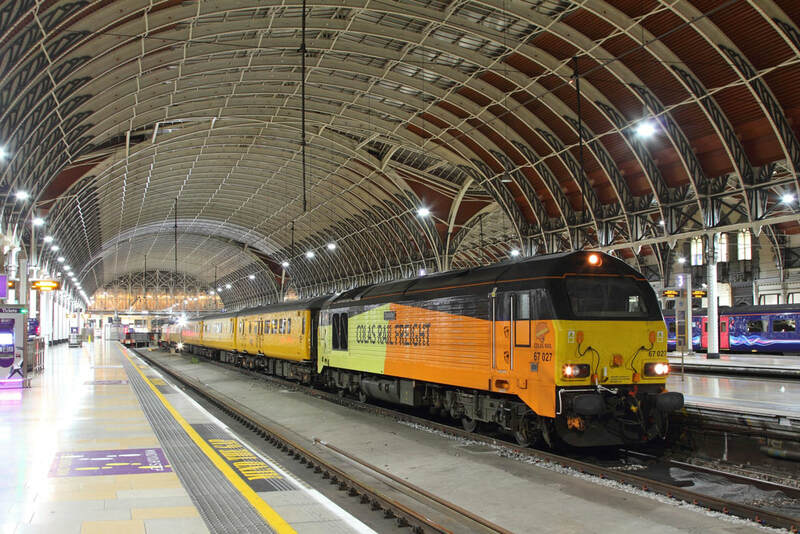 GWR ​57605 on the 1C99 London Paddington to Penzance at London Paddington on the 13th October 2017. 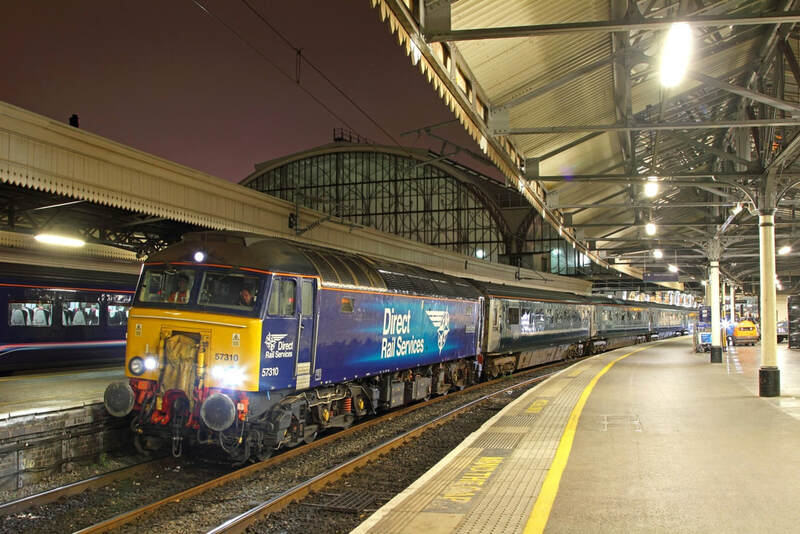 DRS 57310 on the 5Z97 London Paddington to Old Oak Common at London Paddington (with 57603 on the rear) on the 14th October 2017. 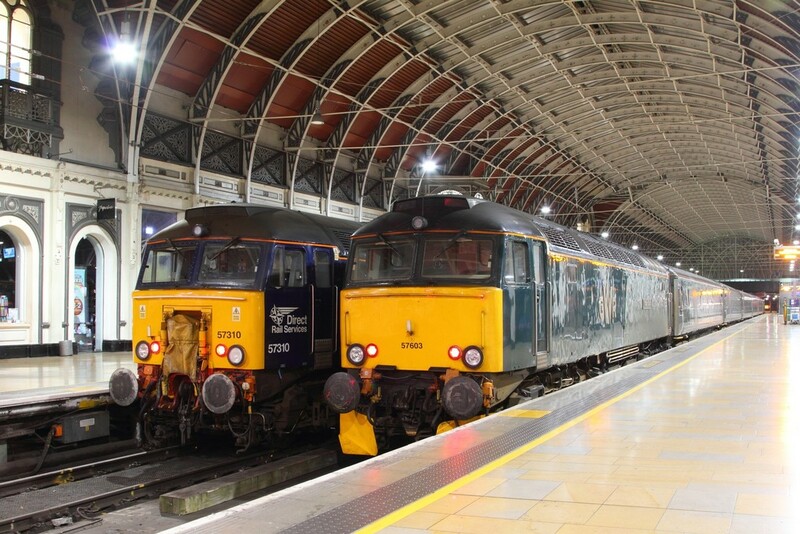 Two Sleeper trains in London Paddington: ​57310 on the 5C99 OOC to PAD for 57605 to take as 1C99 to PZ next to 57603 having arrived with 5Z96 1700 Penzance to Paddington at London Paddington on the 13th October 2017. 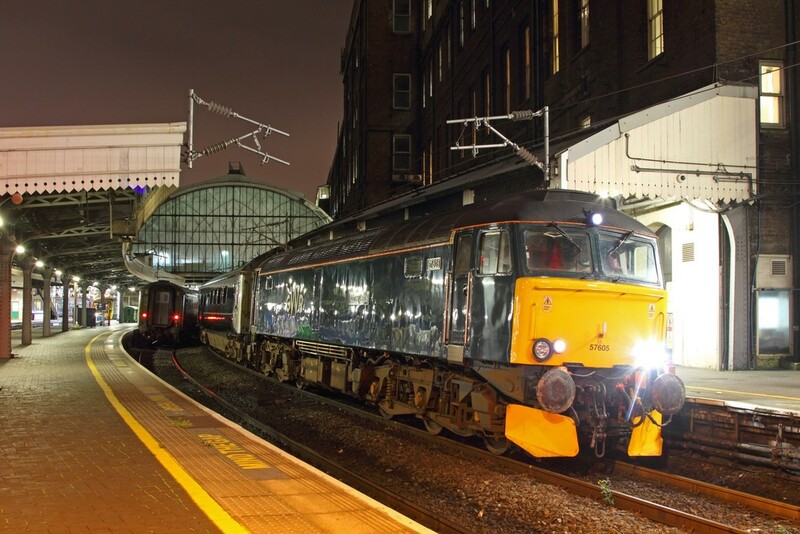 London Paddington line up: 332007 on 1Y94 ex-Heathrow, 67023+67027 on 1Q18 Reading to Derby, 165123 on 2R93 to Reading, 57603 on 5Z96 ex-PZ and 57310 on 5C99 ex-OOC, all at London Paddington on the 13th October 2017. 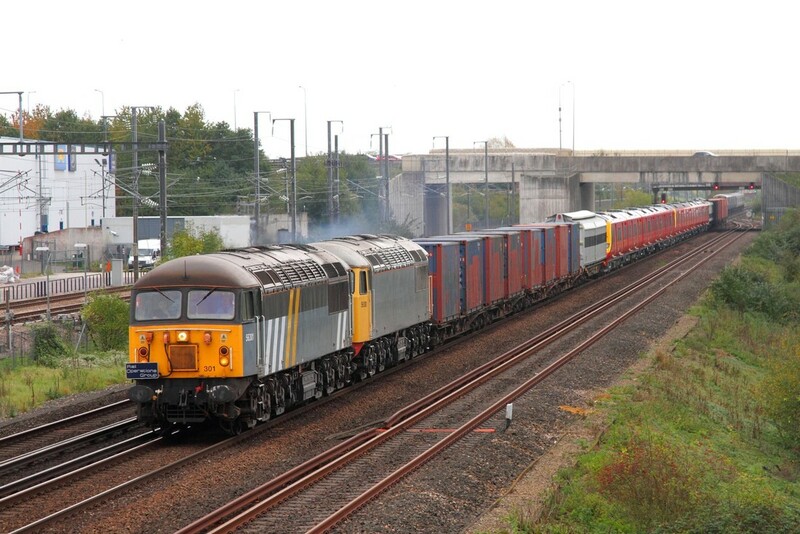 Fastline coloured 56301 leads 56081 on the 6Z17 Foxton to Wembley at Finsbury Park on the 13th October 2017. 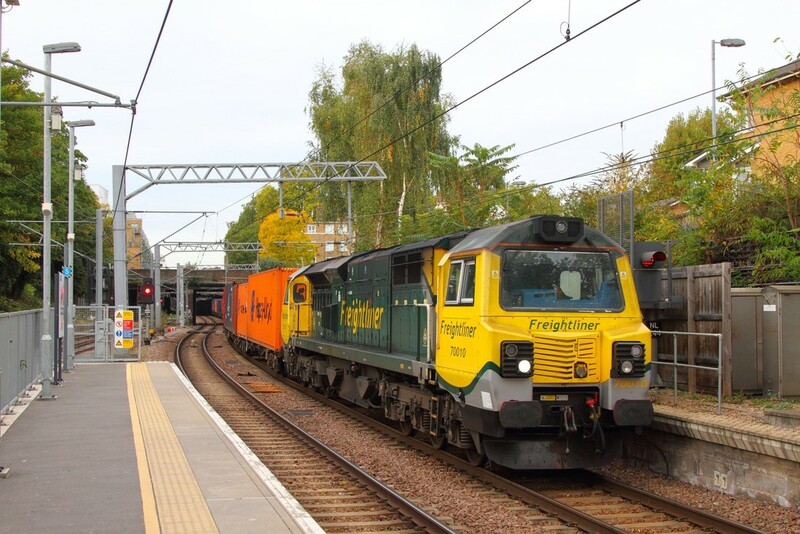 Freightliner 70010 powers the diverted 4L52 Garston to London Gateway at Highbury & Islington on the 4th October 2017. 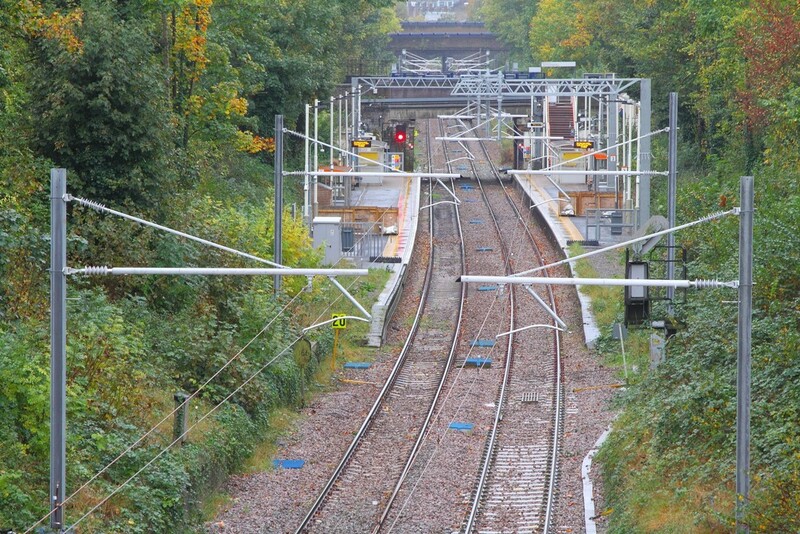 Diverted because the Gospel Oak to Barking is closed for electrification. 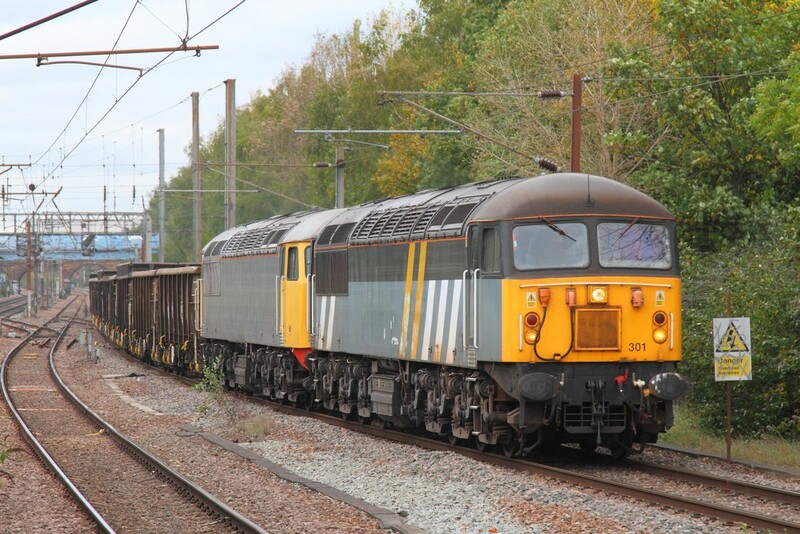 Freightliner Powerhaul 90043+90045 on the 4S44 Daventry to Coatbridge at Greenholme on the 2nd October 2017. 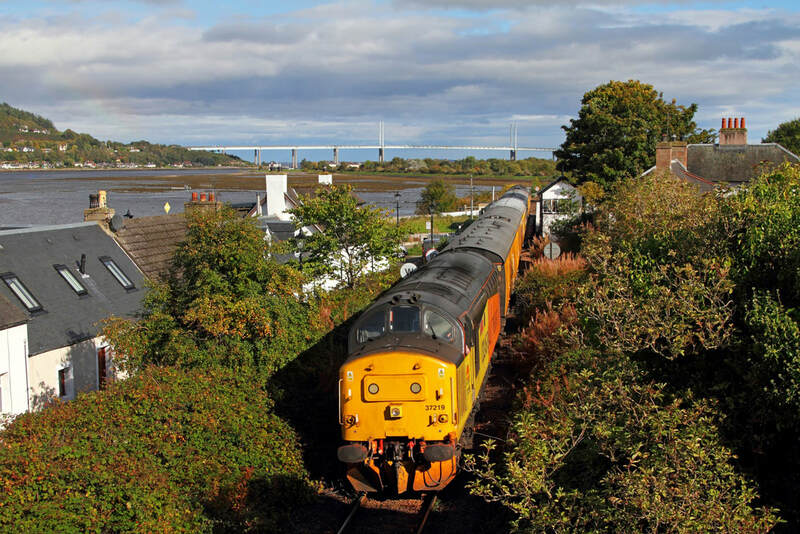 Colas Rail 37421 tnt 37219 on the 1Q78 Inverness to Inverness via Kyle of Lochalsh at Dingwall on the 1st October 2017. 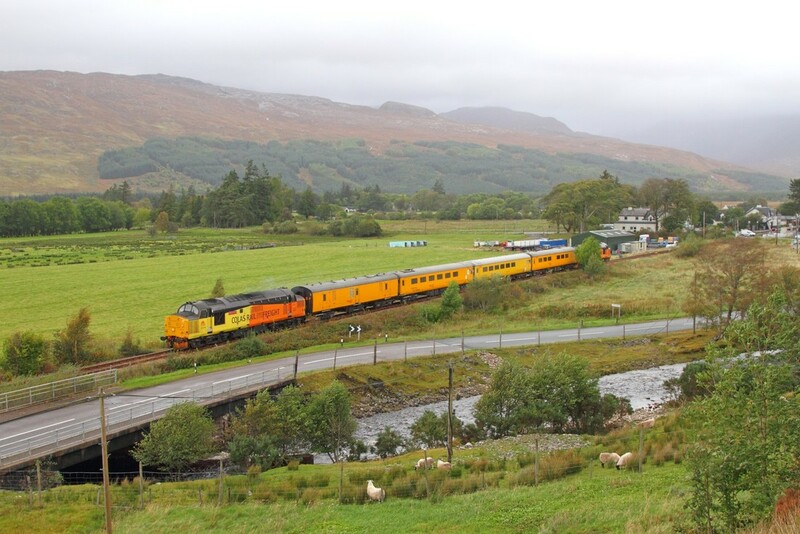 Colas Rail 37421 tnt 37219 on the 1Q78 Inverness to Inverness via Kyle of Lochalsh at Garve on the 1st October 2017. 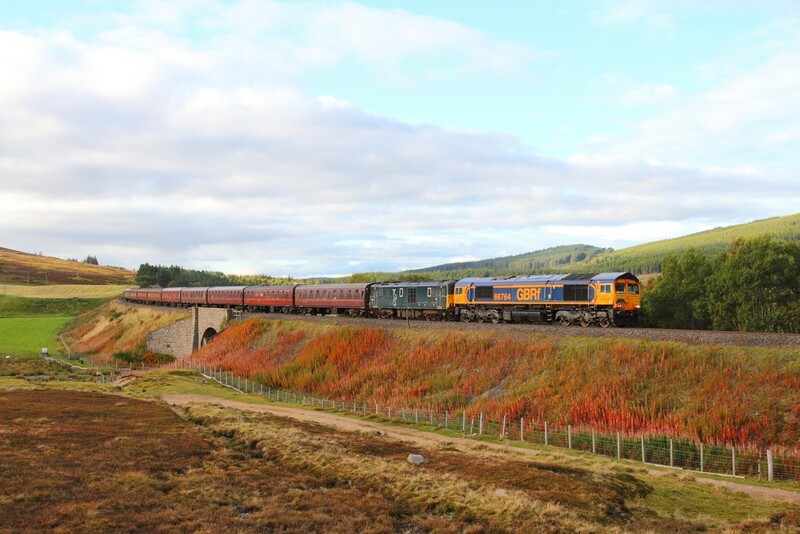 ​37421 tnt 37219 on the 1Q78 Inverness to Inverness via Kyle of Lochalsh at Loch Achanalt heading back to Inverness on the 1st October 2017. 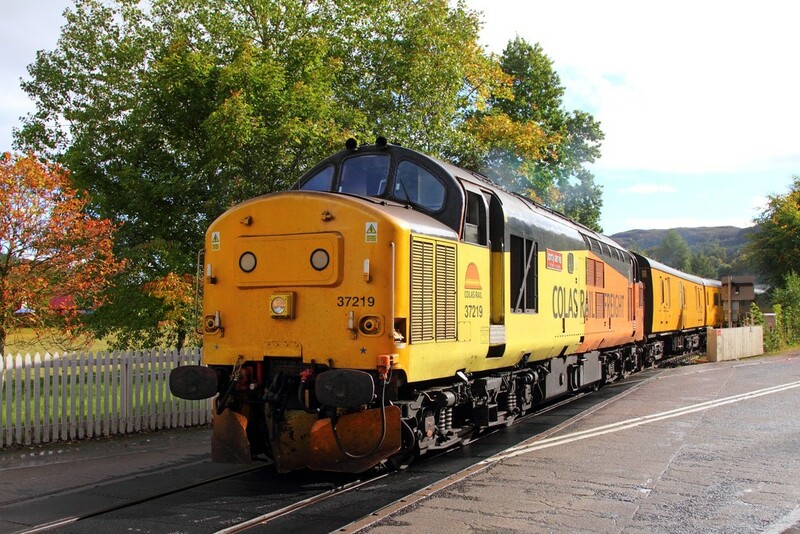 Colas Rail 37421 tnt 37219 on the 1Q78 Inverness to Inverness via Kyle of Lochalsh at Duncraig halt on the 1st October 2017. 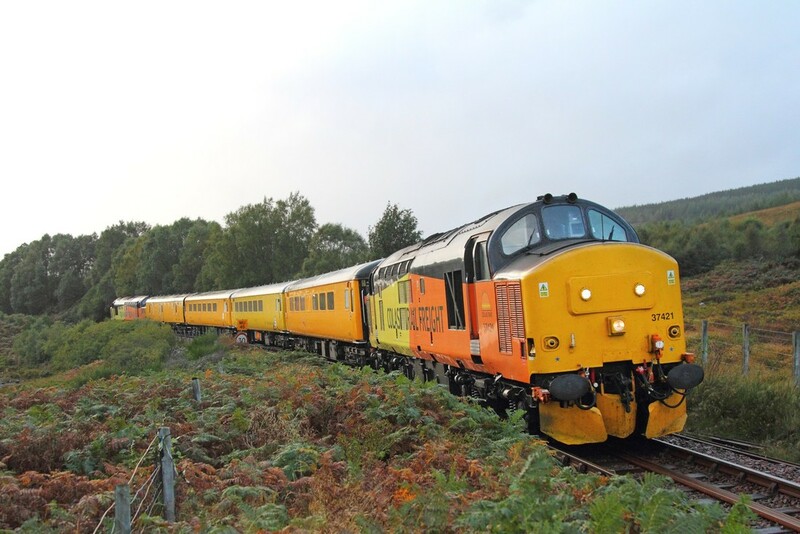 Colas Rail ​37219 tnt 37421 on the 1Q78 Inverness to Inverness via Kyle of Lochalsh at Badicaul on the 1st October 2017. 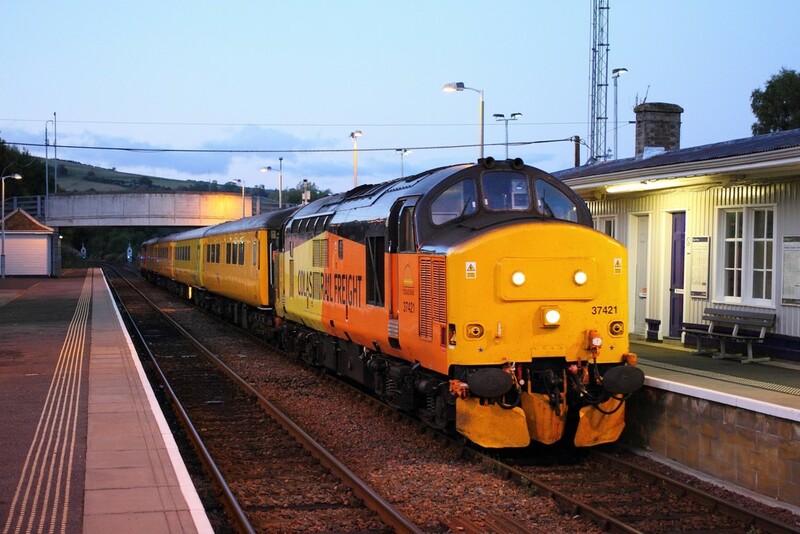 Colas Rail ​37219 tnt 37421 on the 1Q78 Inverness to Inverness via Kyle of Lochalsh departing Strathcarron on the 1st October 2017. 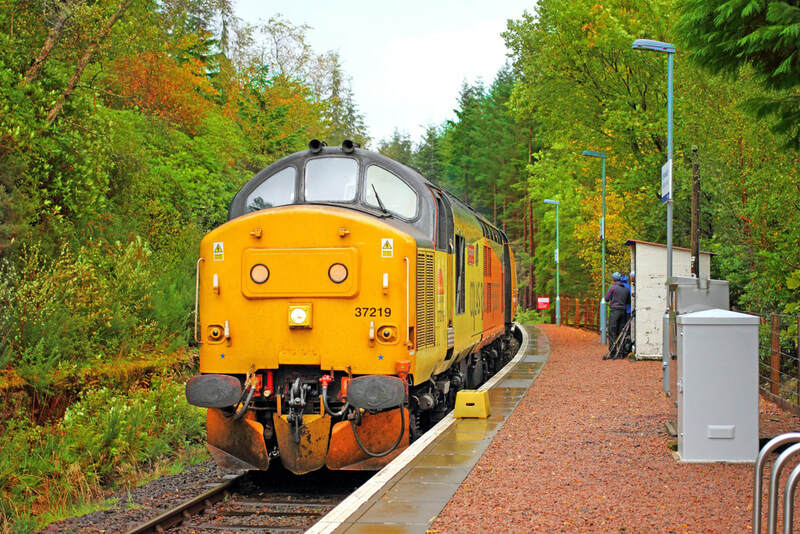 Colas Rail ​37219 tnt 37421 on the 1Q78 Inverness to Inverness via Kyle of Lochalsh at Achnashellach on the 1st October 2017. 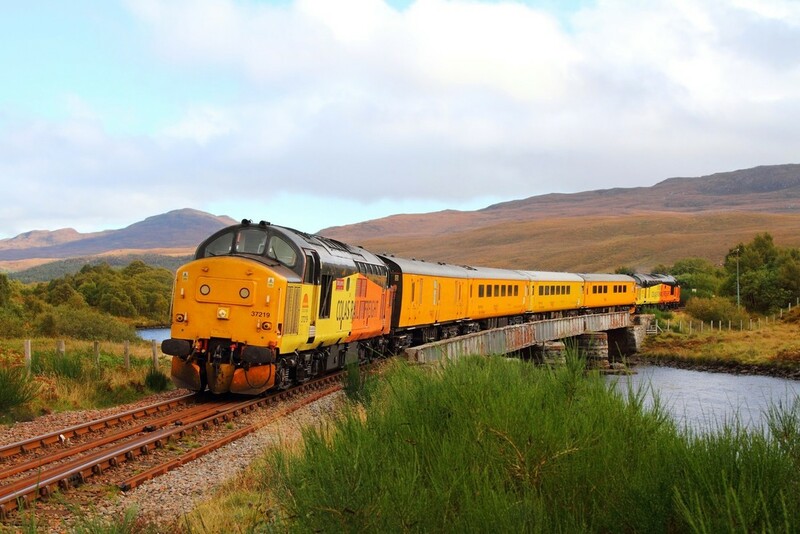 Colas Rail ​37219 tnt 37421 on the 1Q78 Inverness to Inverness via Kyle of Lochalsh departing Garve on the 1st October 2017. 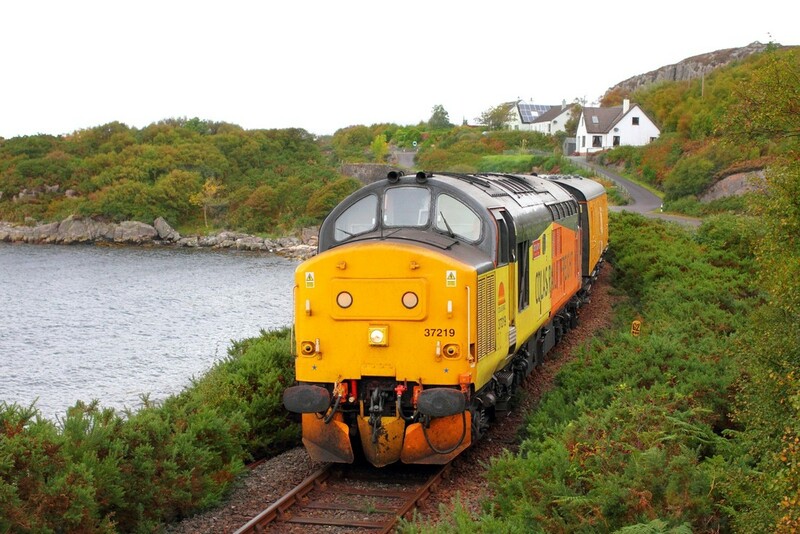 Colas Rail ​37219 tnt 37421 on the 1Q78 Inverness to Inverness via Kyle of Lochalsh at Loch Achanalt on the 1st October 2017. 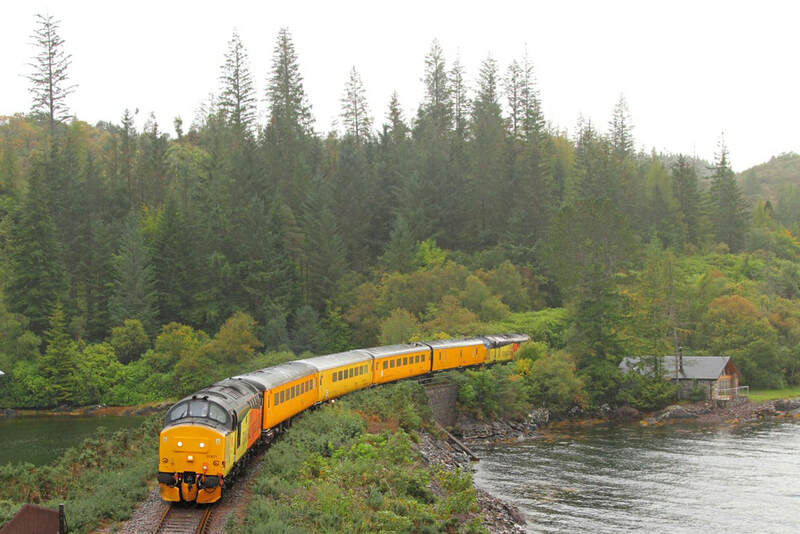 Colas Rail 37219 tnt 37421 on the 1Q78 Inverness to Inverness via Kyle passes Beauly Firth at the former station site at Clachnaharry. 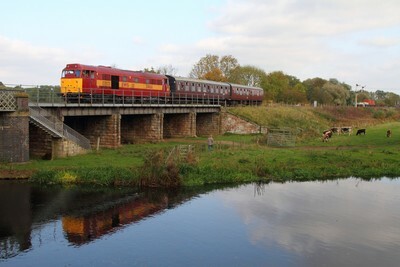 Kessoch bridge is in the background. Taken on the 1st October 2017. 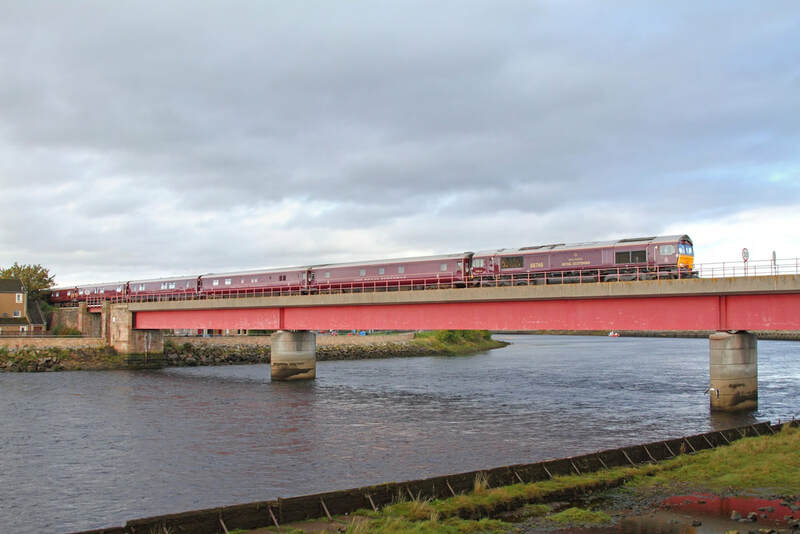 Royal Scotsman 66746 on the 1H81 Kyle of Lochalsh to Boat of Garten at Ness bridge (opened on 14th May 1990 after the original viaduct collapsed on 7th February 1989) on the 1st October 2017. 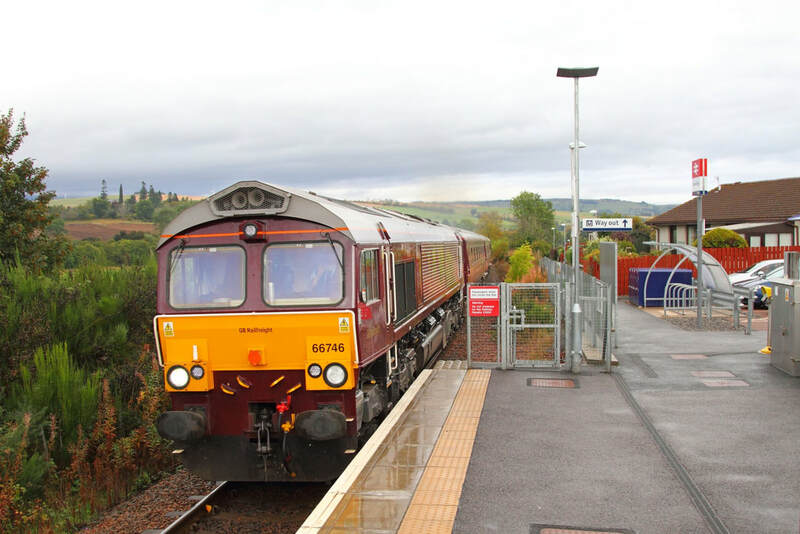 Royal Scotsman ​66746 on the 1H81 Kyle of Lochalsh to Boat of Garten passes the shack of Conon Bridge on the 1st October 2017. 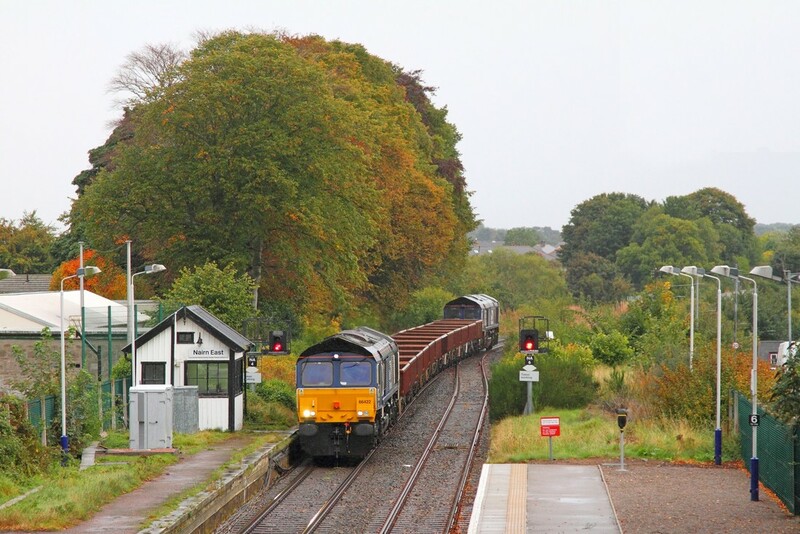 DRS 66422 tnt 66423 at Nairn on the 6K50 Elgin to Mossend on the 1st October 2017. 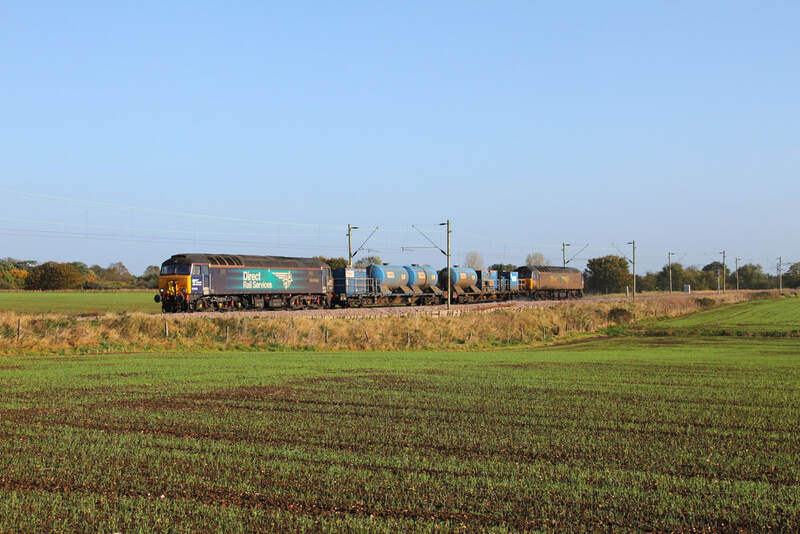 DRS ​66422 tnt 66423 at Nairn on the 6K50 Elgin to Mossend on the 1st October 2017. 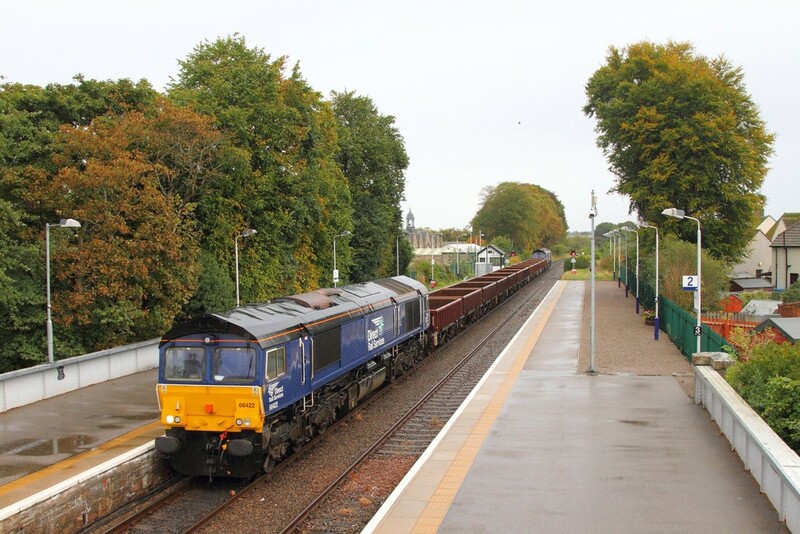 GBRf ​66764+73970 on the 1Z50 Inverness to Ayr at Tomatin on the 30th October 2017. 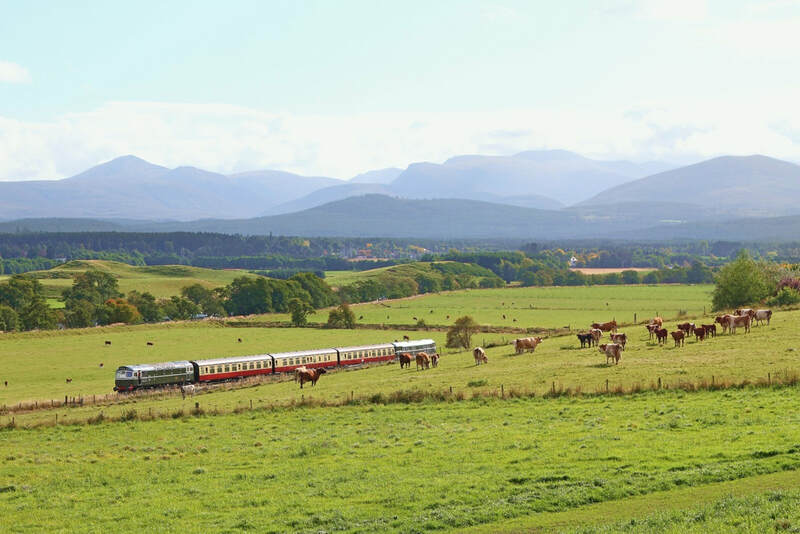 Br Green ​D5862 31327 departing Broomhill with the 1440 Broomhill to Aviemore on the 30th September 2017. 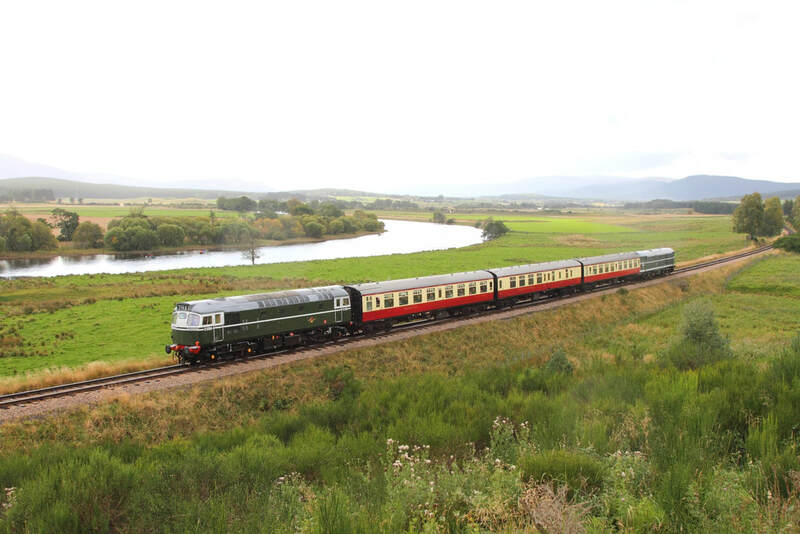 Br Green D5862 31327 departing Boat of Garten with the 1305 Boat of Garten to Aviemore on the 30th September 2017. 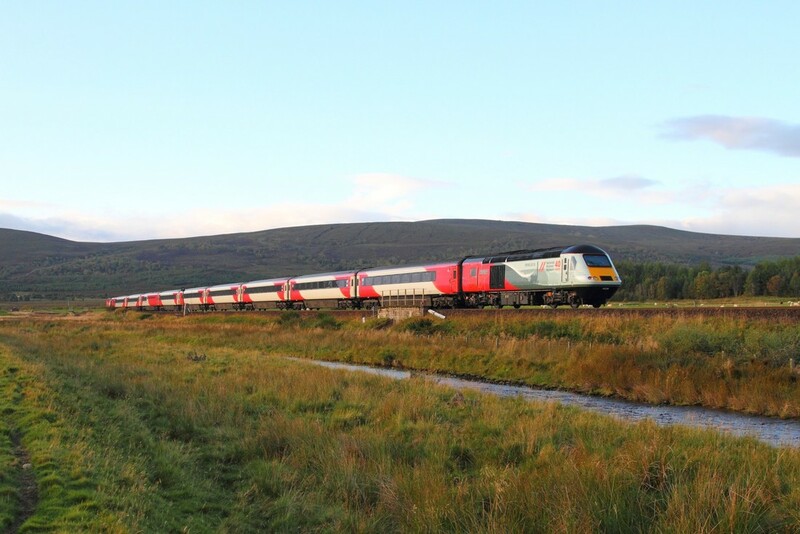 Br Green ​27050 tnt 31327 departing Dulnain bridge on the new extension heading back to Aviemore on the 30th September 2017. 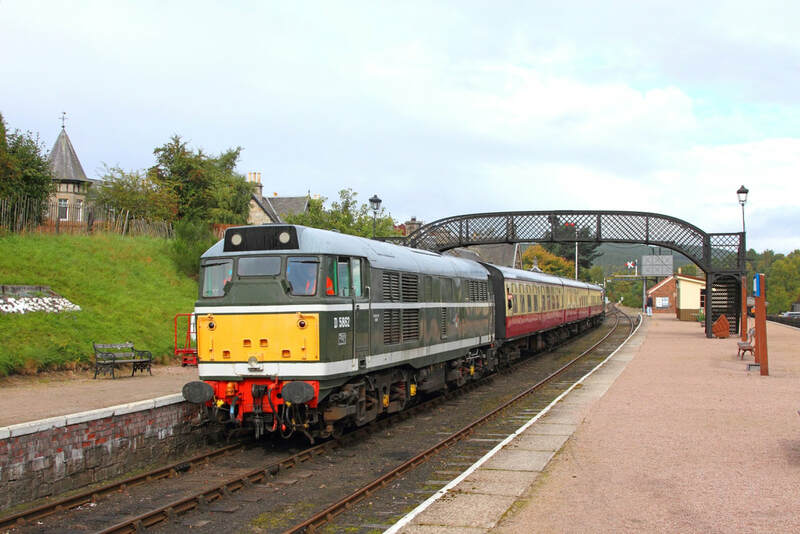 Br Green D5394 27050 on the 1245 Aviemore to Boat of Garten arriving at Broomhill on the 30th September 2017. 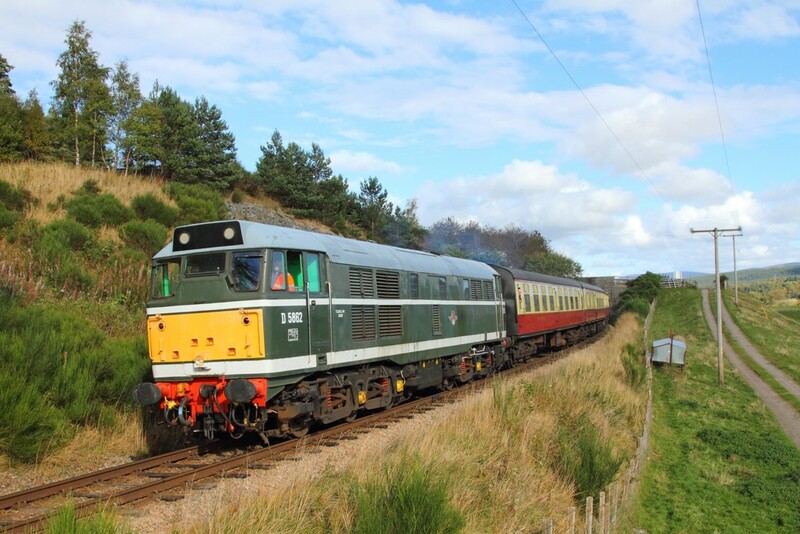 Br Green D5394 (27050) on the 1245 Aviemore to Boat of Garten arriving at Boat of Garten on the 30th September 2017. 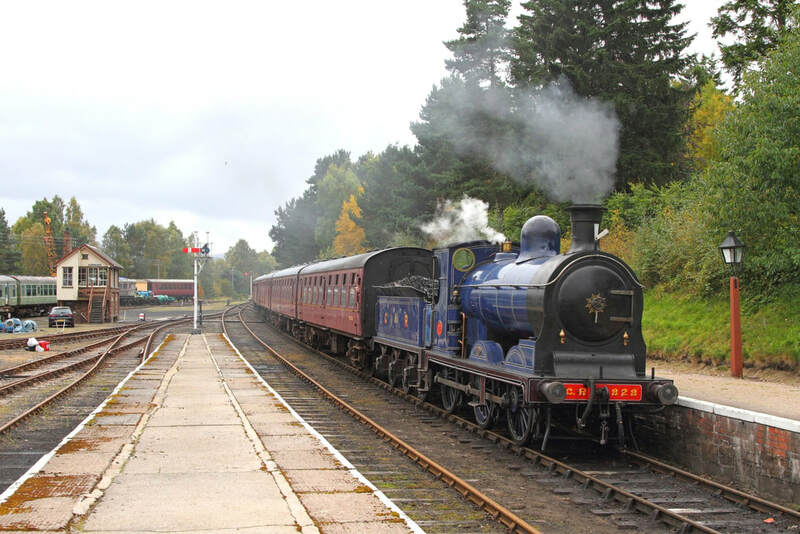 Caledonian Railway ​CR828 on the 1230 Aviemore to Broomhill at Boat of Garten on the 30th September 2017. 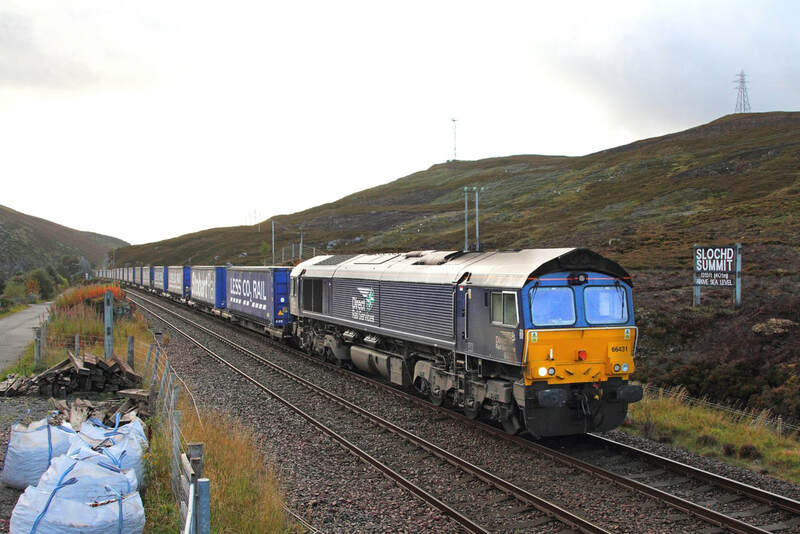 DRS ​66431 on the 4H47 Mossend to Inverness at Slochd Summit on the 30th September 2017. 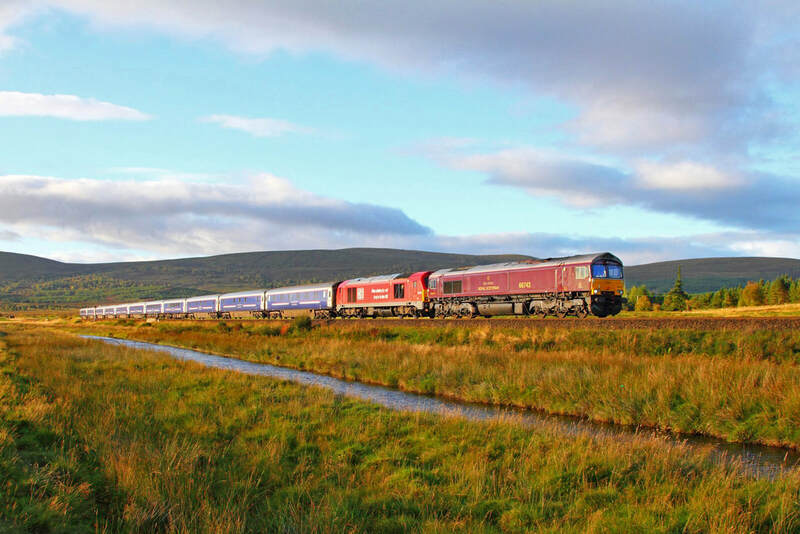 National Railway Museum liveried ​43238 hangs on the rear of 43206 on the 1E13 Inverness to London Kings Cross at Moy on the 30th September 2017. 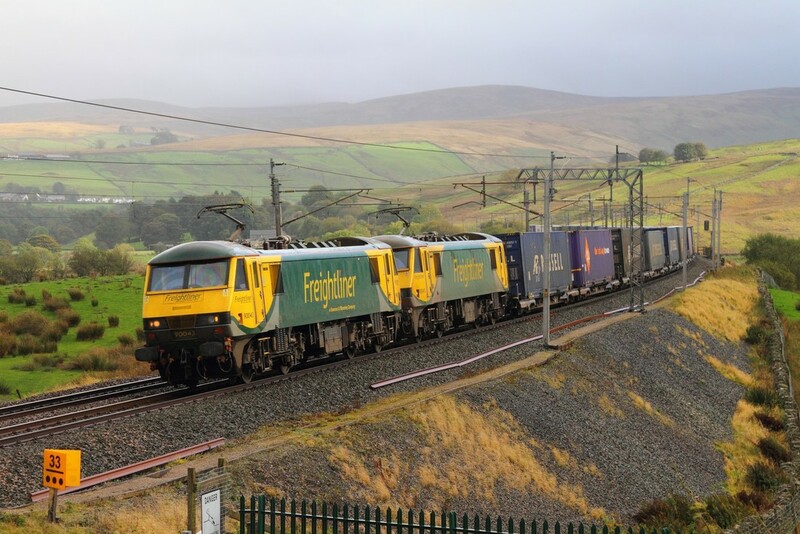 Royal Scotsman 66743 leads 67013 on the 1S25 London Euston to Inverness (load 11) at Moy on the 30th September 2017. 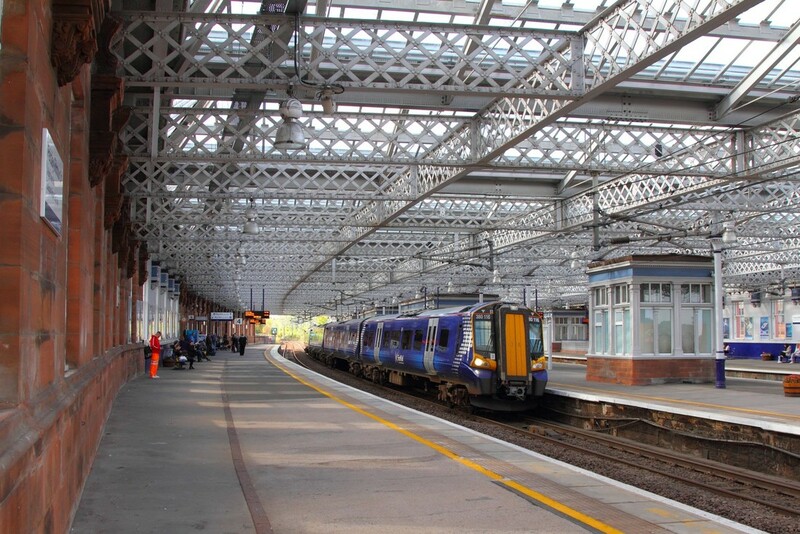 Scotrail ​380116 on the 1T16 1353 Largs to Glasgow Cental at Paisley Gilmour Street on the 29th October 2017. 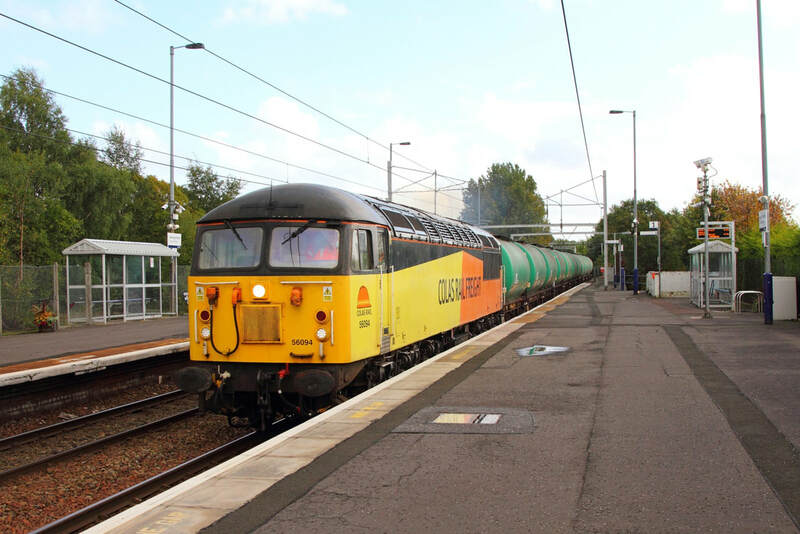 Colas Rail 56094 arrives at Grangemouth with 6N47 Prestwick to Grangemouth tanks on the 29th September 2017. 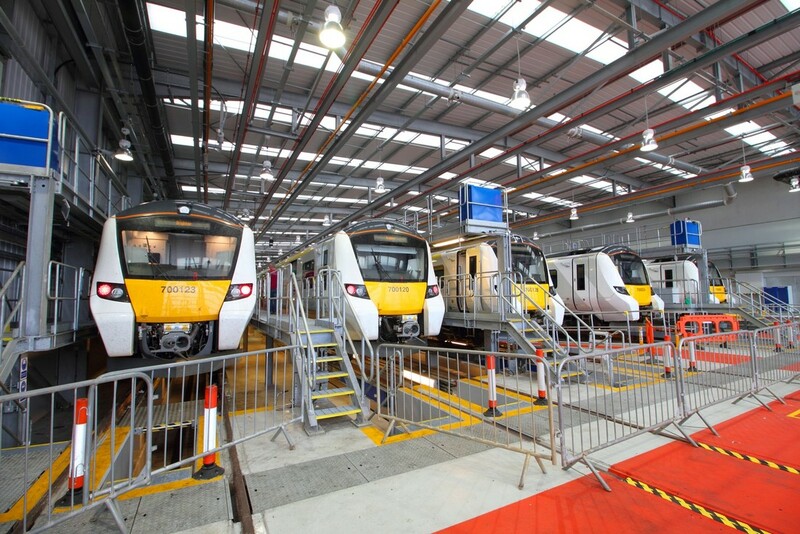 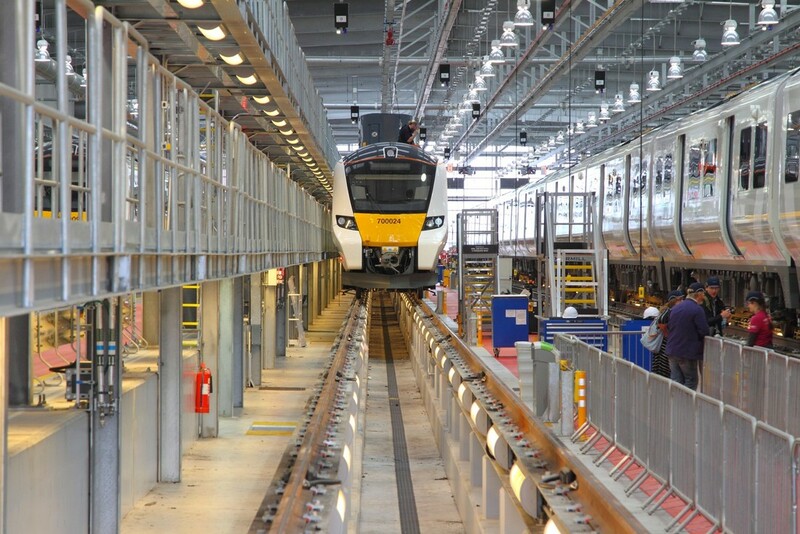 Notice the pillars are in for electrification. 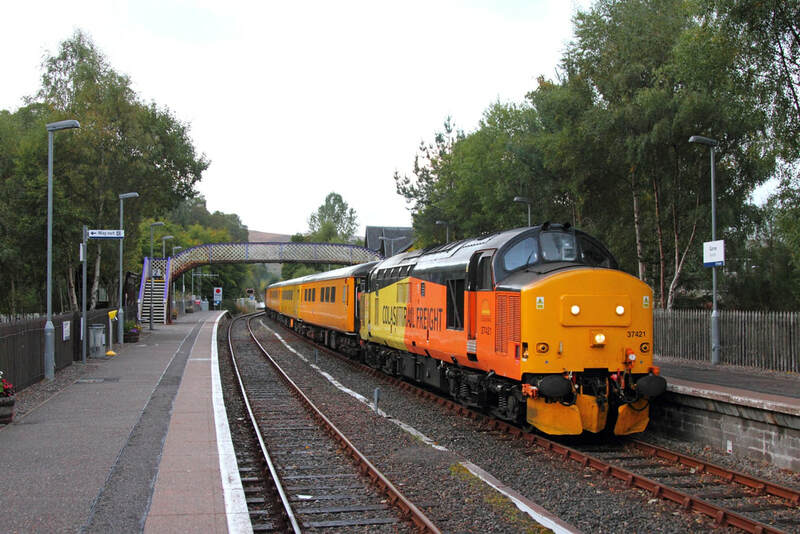 Colas Rail 56094 passes Coatbridge Central on the 6N47 Prestwick to Grangemouth on the 30th September 2017. 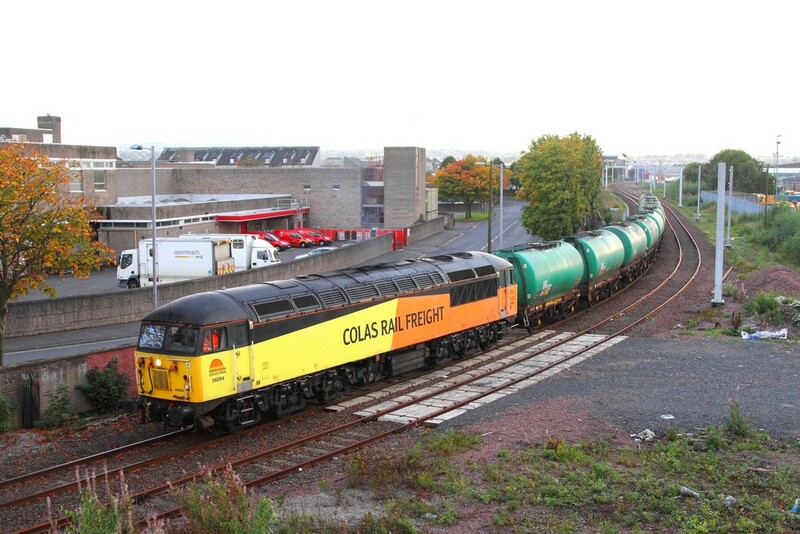 Colas Rail ​56094 works the 6N47 Prestwick to Grangemouth under the iconic roof at Paisley Gilmour Street on the 1st October 2017. 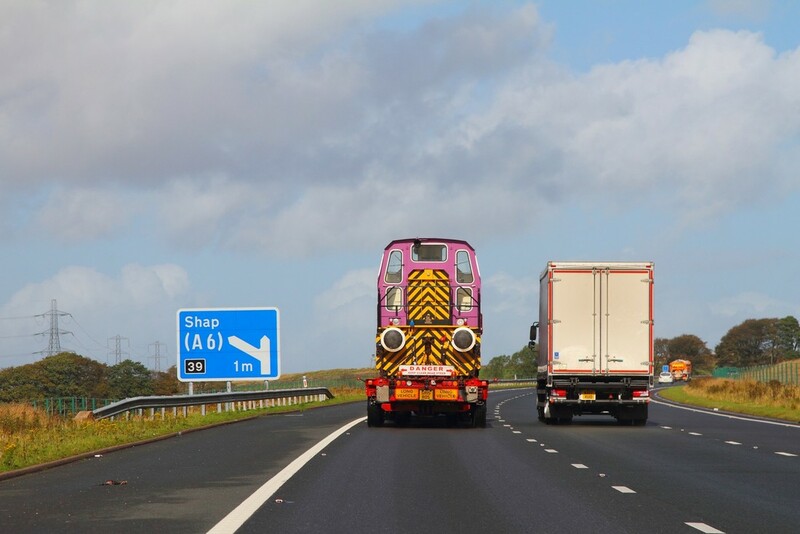 MOD ​01510 on the M6 passes Shap Jnc 39 moving from Barton under Needwood to MOD Longtown Cumbria on the 29th September 2017.